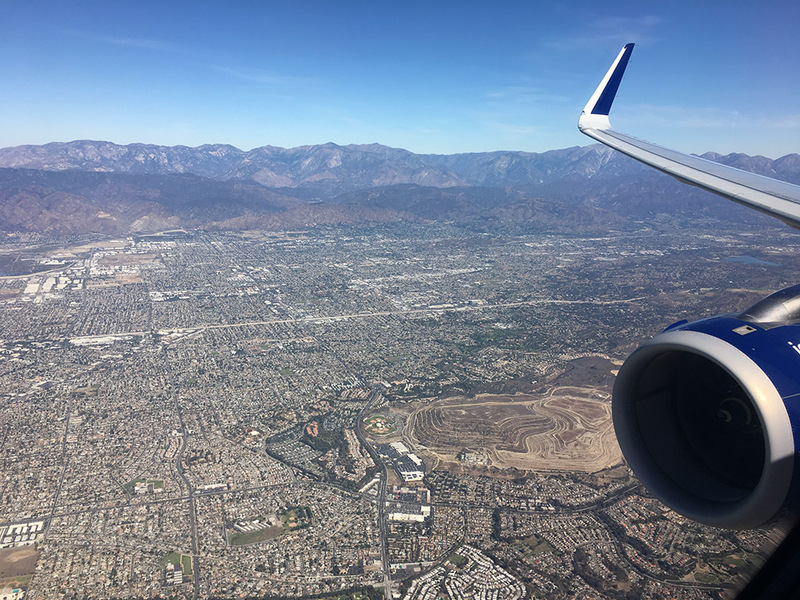 As strange as it may sound, this jetBlue flight from New York to Los Angeles was the flight I was looking forward to the most on this trip. 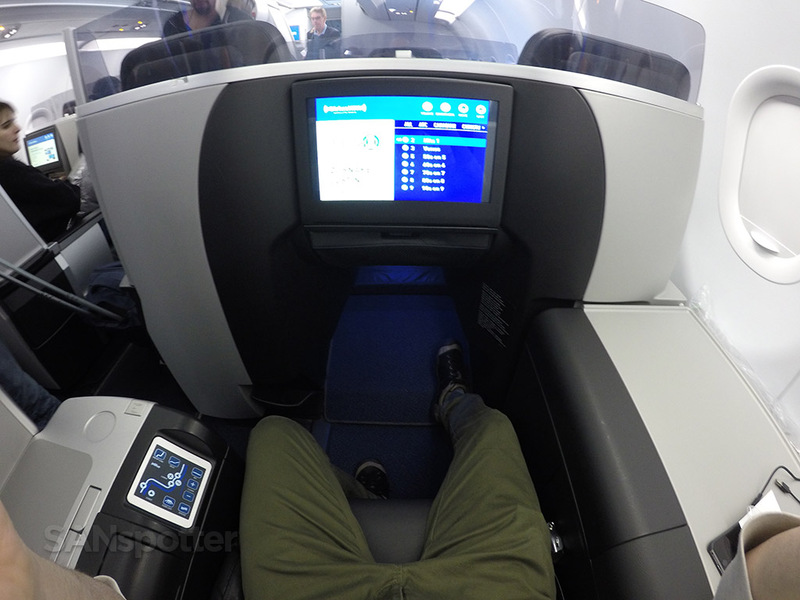 Of course I had tons of fun being wined and dined in British Airways Club World and Virgin Atlantic Upper Class – but I’ve heard nothing but rave reviews about jetBlue’s A321 Mint (premium transcon) service and I’ve been desperately trying to find excuses over the past several years to try it out for myself. 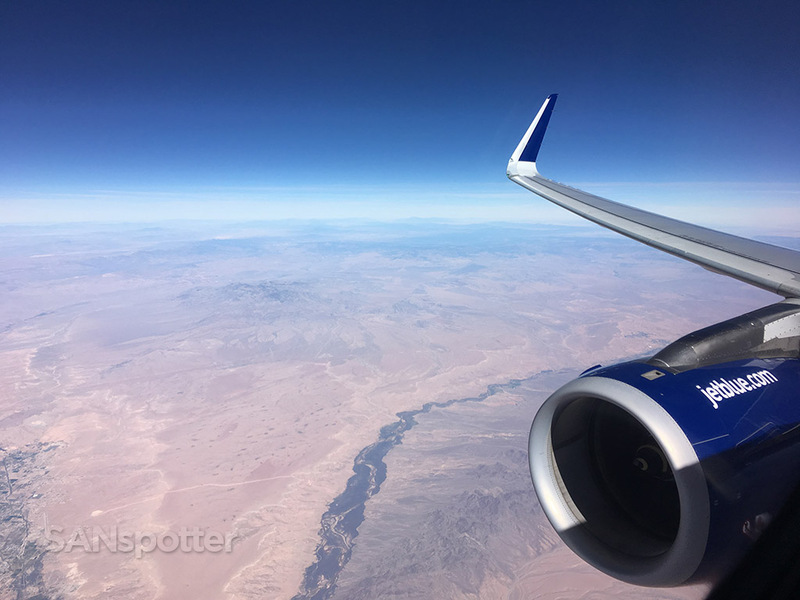 So when I found myself with an itinerary that required getting from New York back to San Diego (in any way possible), I jumped at the chance to give this a try. The taxi ride from midtown Manhattan to JFK was super quick this morning, just as I had hoped. 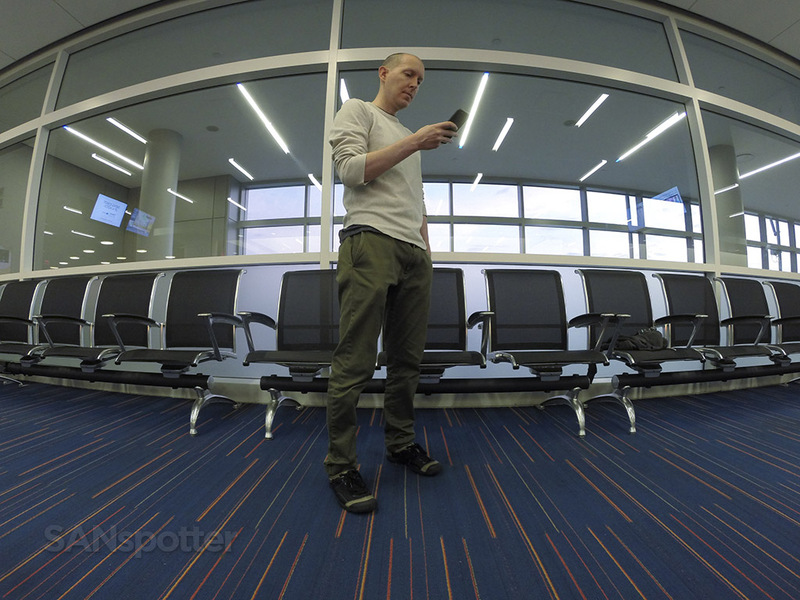 Writing these trip reports (and making videos) takes a lot of time and I always like to arrive at the airport with plenty of time to spare in order to get all the content I need to make things interesting. So even though my flight wasn’t scheduled to depart until 8:40am, I found myself standing in the middle of the zoo that is the T5 departures hall at 6:20am. 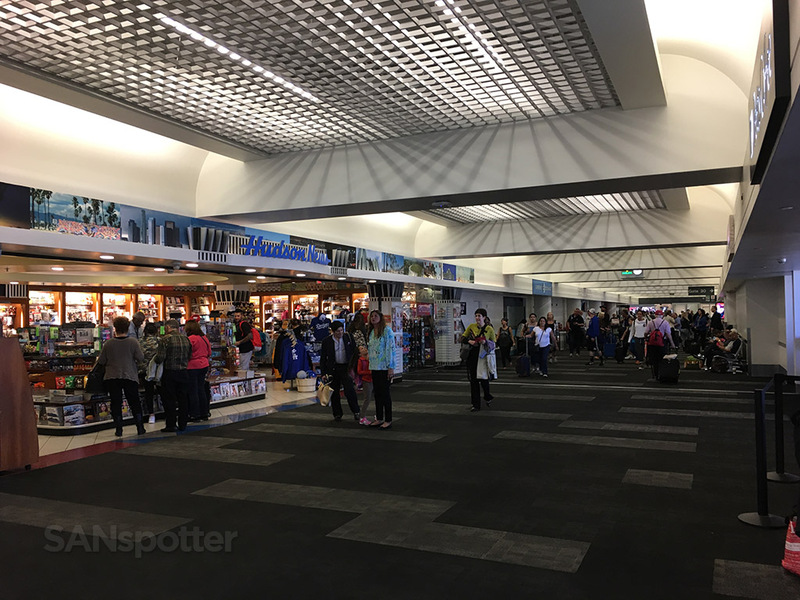 I’m not even kidding when I say the place was a zoo – I really wasn’t expecting the airport to be that busy so early in the morning, so it was quite a shock to see wall-to-wall passengers and a massive queue (which snaked all around the terminal) for the security checkpoint. 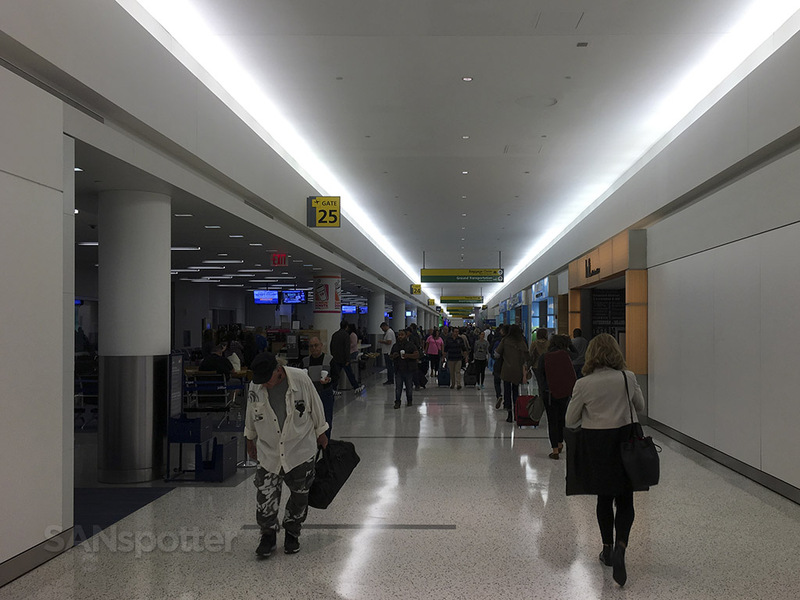 Welcome to T5 at JFK. 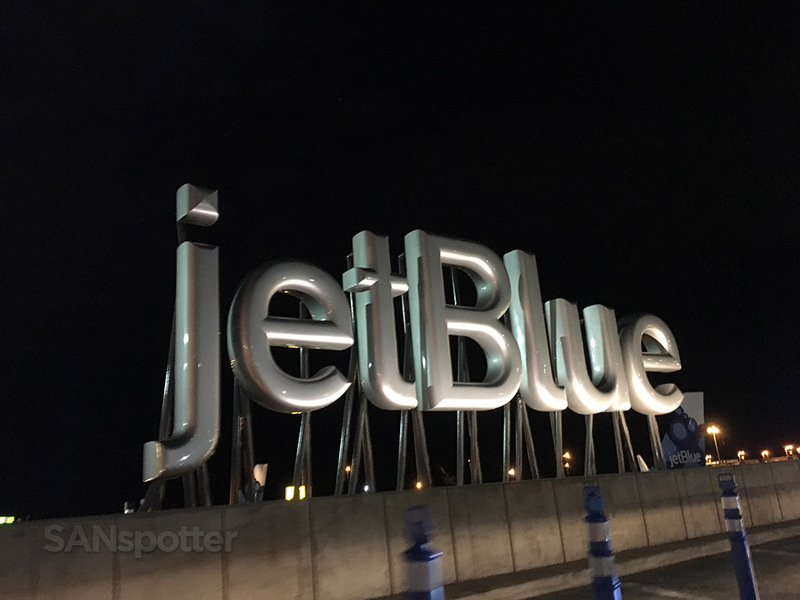 Home of jetBlue! Standing curbside at terminal 5 moments before walking in and joining the masses. 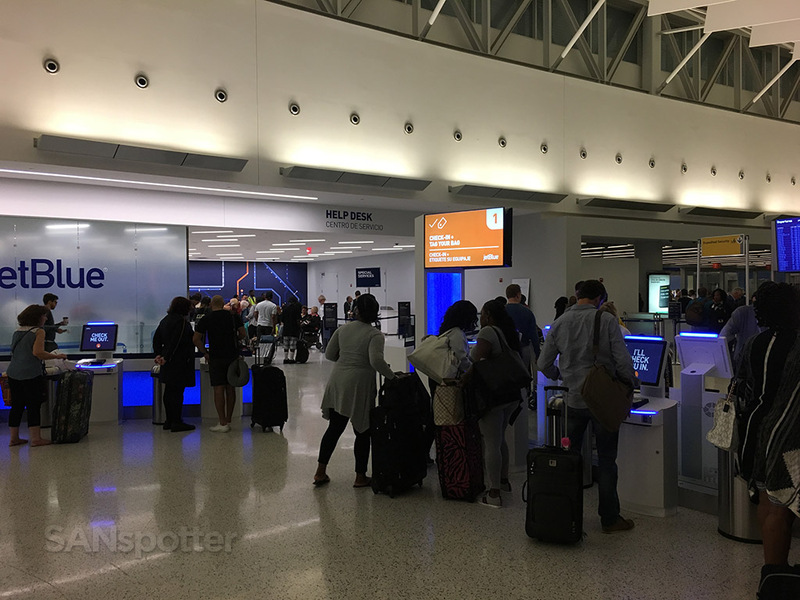 JetBlue check in counters and baggage drop T5 JFK. Luckily the security checkpoint line moved quickly, and it only took about 20 minutes to make it to the scanner. Not too bad at all, though I was a bit disgruntled when I reached the front of the line and I noticed that there was a separate (and much shorter) line for premium passengers such as myself. Grrr. Oh well. JetBlue A321 seat map (from seatguru.com) showing my seat for this flight. Despite the short delay getting through security, I still had quite a bit of time to kill before the flight was scheduled to board. 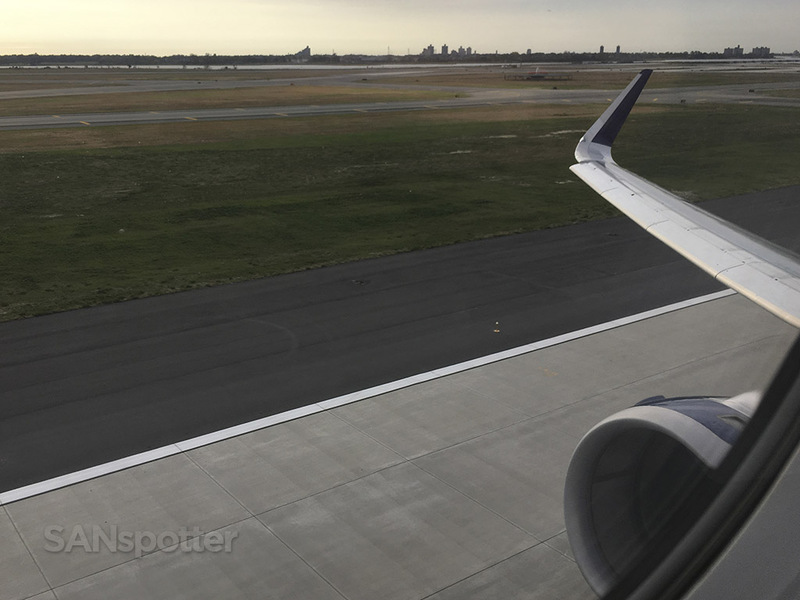 That meant wandering the airport, walking up and down the terminal, checking things out, and making sure I had a lot of juicy content for this trip report. 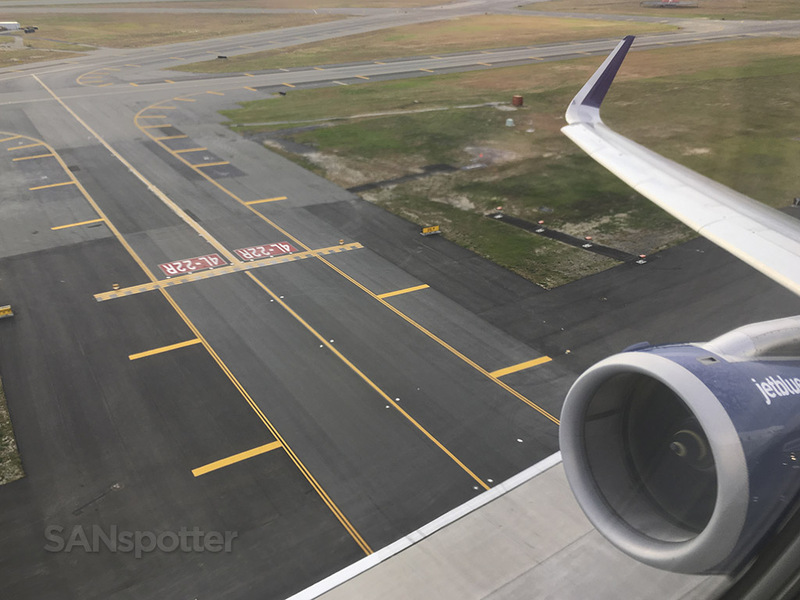 I’m not sure I would go as far as to call these pics “juicy” (T5 at JFK isn’t THAT interesting) but I definitely had the time to get the pics I needed. Especially when they delayed the flight another 20 minutes just about 10 minutes before boarding was supposed to start. 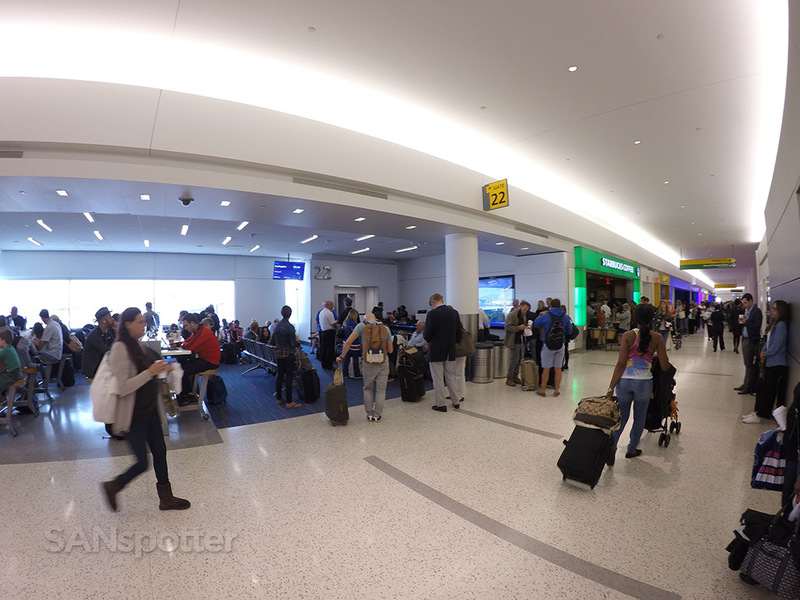 This was my first time inside T5 at JFK – the center section is nice, but the gate areas aren’t as interesting. Now that’s my kind of sculpture! 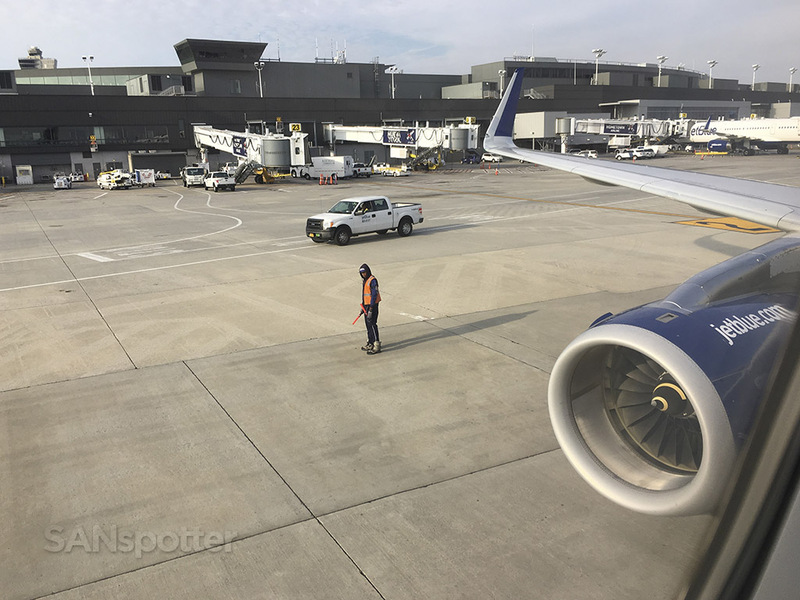 I guess I never realized how big those v2500 engines really are, but standing next to one here in the terminal really puts it into perspective. 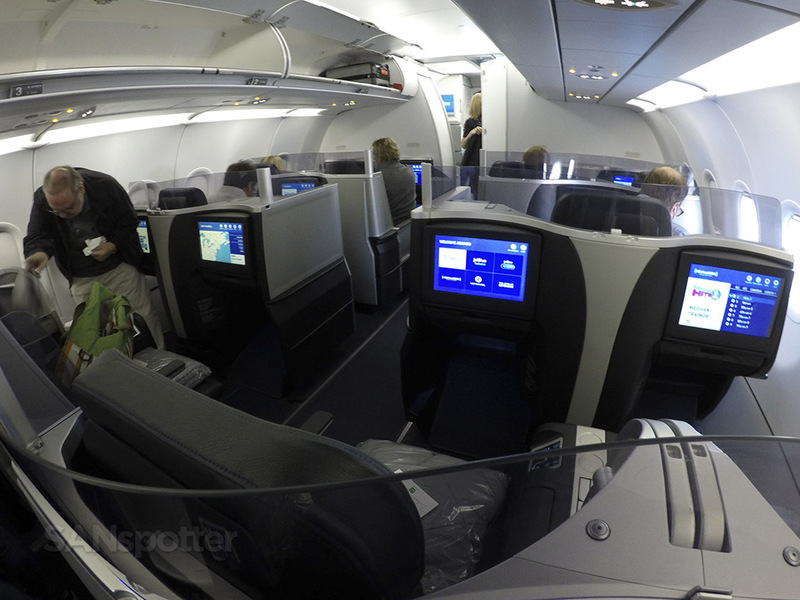 As you can see, T5 is relatively sterile (surprising considering how stylish of a brand JetBlue is). There were some “pockets” of cool scattered about though – these retro-looking relaxation pods seemed inviting. Checking to make sure I got all the pics and video I needed for this trip report! N934JB (“The Ultamint Experience”) pulling up to the gate – a bit late, but it was good to see it nonetheless. 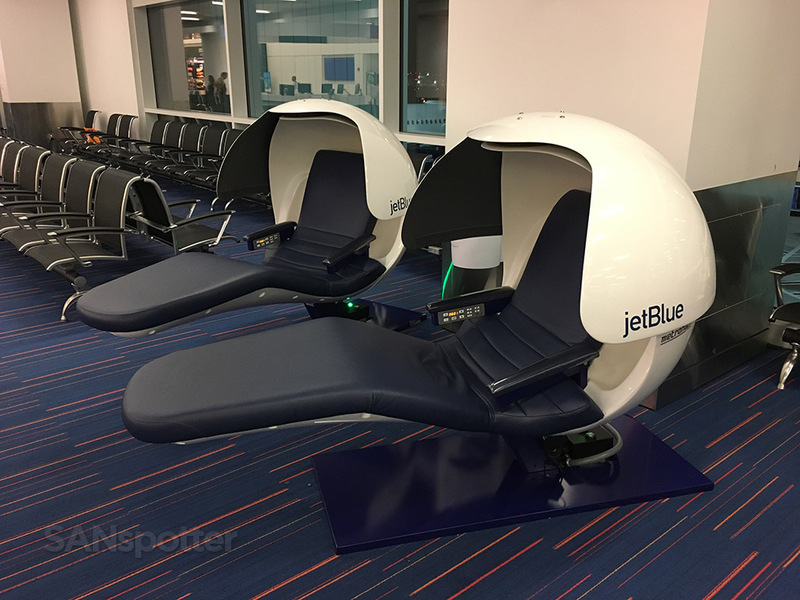 While waiting in the gate area for the flight to board, I couldn’t help but to think that jetBlue is in desperate need of a proper lounge here at JFK. 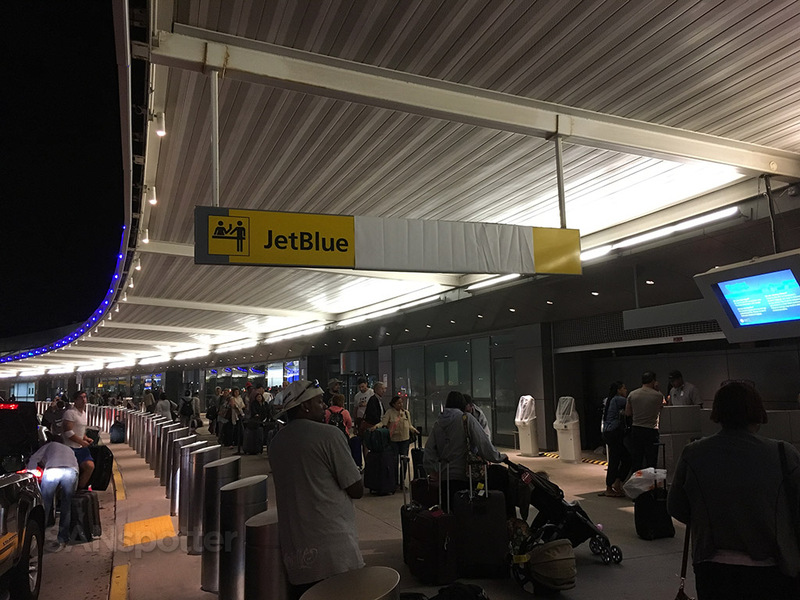 Even though I was holding a ticket for one of the best premium transcon seats in the market today, I had nowhere to go to escape the chaos of the main terminal. 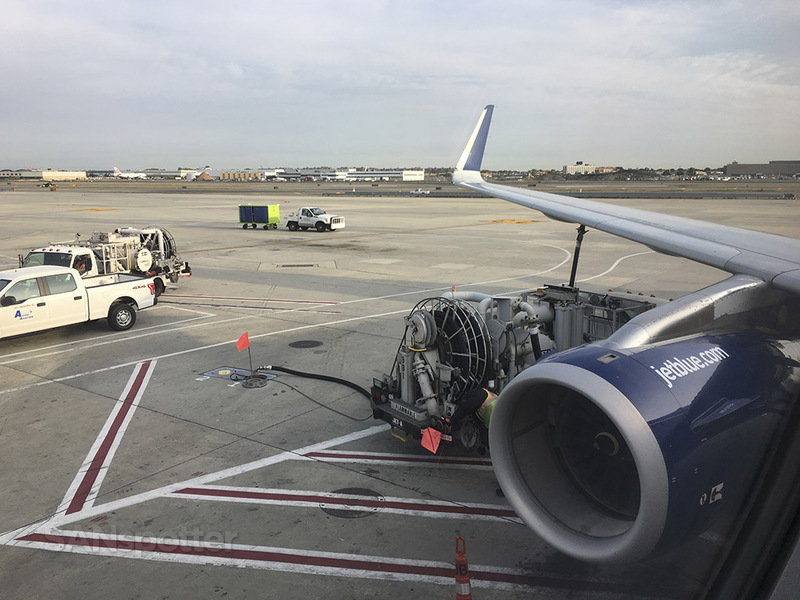 Compare that with the really nice lounges that both Delta and American offer as part of their premium transcon experience, and jetBlue really comes up short here. 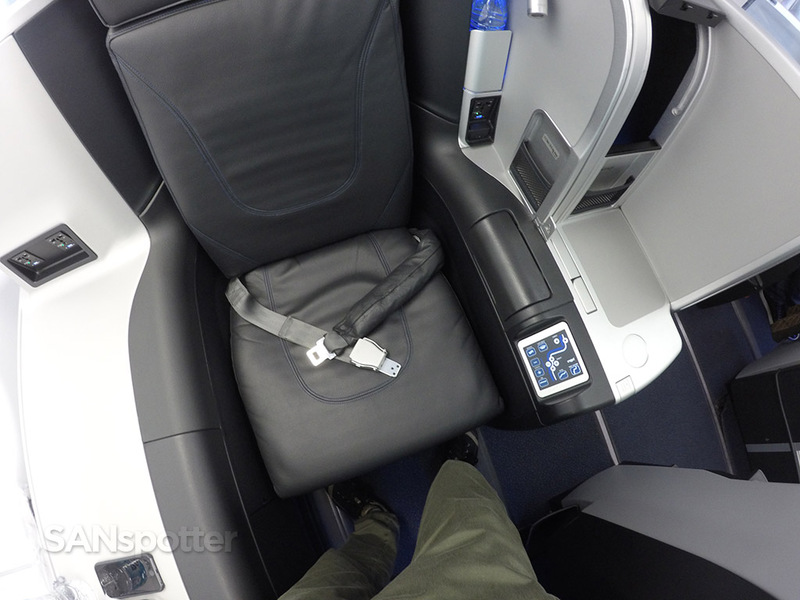 This is the ground experience for the JetBlue Mint product. No lounges means waiting at the gate! Moments before they kicked off the boarding process. There she is. Seat 4F (a single-seat suite) and it’s all mine for the next 5 and half hours. Greeting me at the seat was a hand-signed welcome card, eye shades, and a thick duvet. 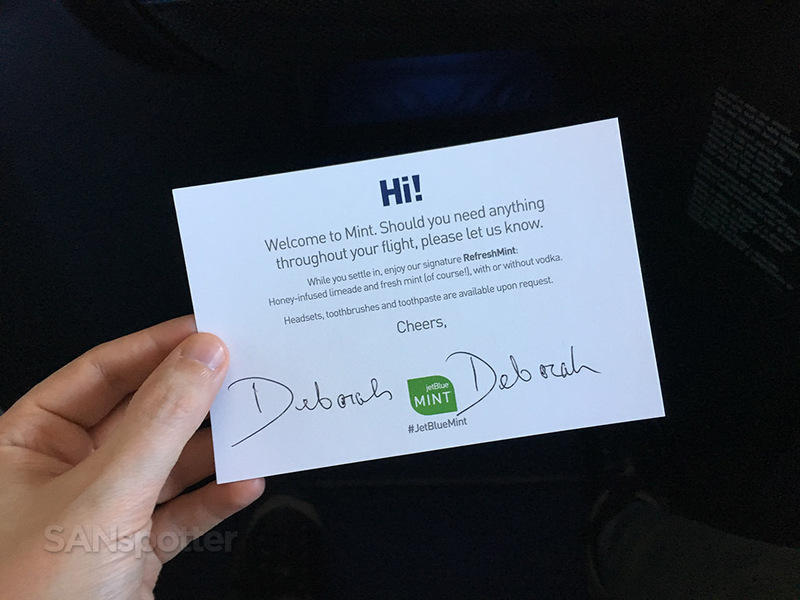 Hand-signed greeting card welcoming me to the JetBlue Mint experience. No Deborah didn’t sign her name twice – both FA’s shared the same name! These Mint seats are really nice, and stuffed to the gills with storage spaces and neat little features. The large storage bin (top right of this pic) is deep enough to swallow the thick duvet when not in use. 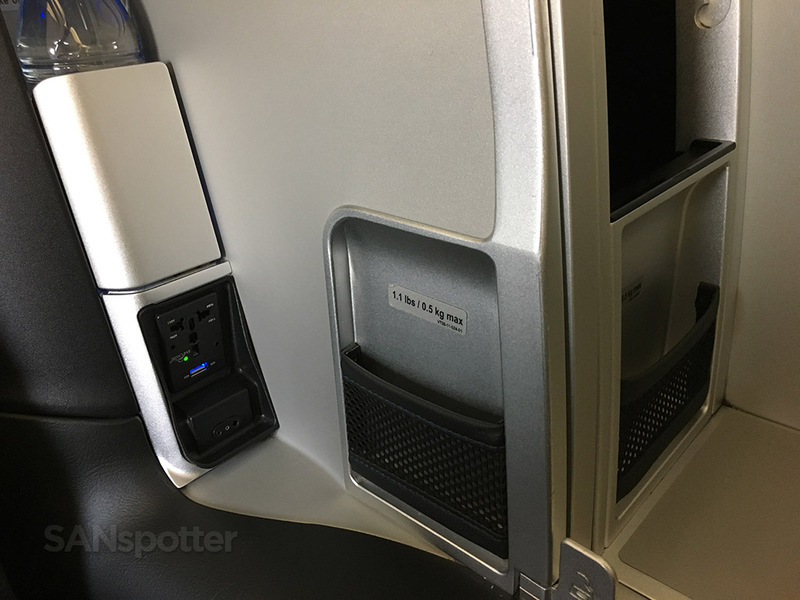 There are two side-by-side power outlets and USB ports in these single-seat-suites. The footwell is nice and wide, and shouldn’t be a problem for tall passengers. 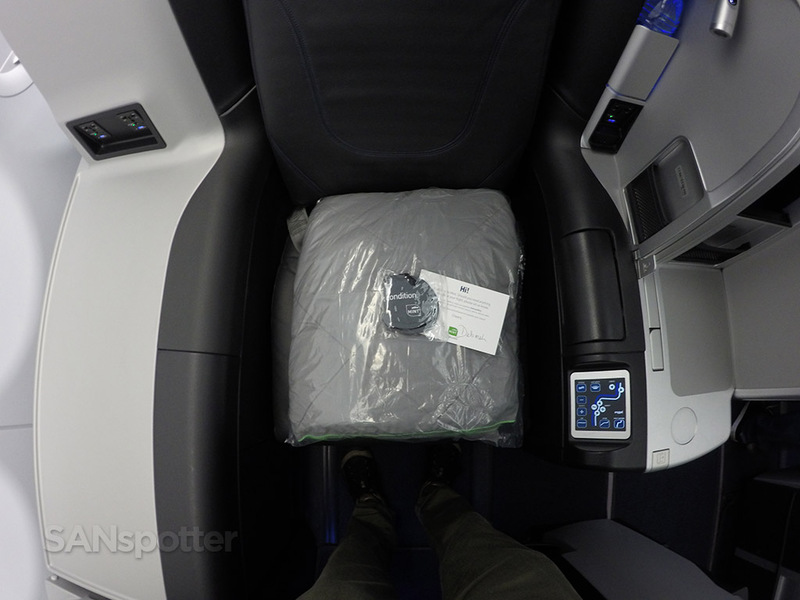 This is the brain of the JetBlue Mint seat. That massage function was killer (in a good way). Close up of all the nooks and crannies (and additional power port) of the Mint seat. These single seats are very private and spacious. The privacy of the Mint cabin is really hard to beat. I was greeted by Deborah (the lead FA) within 30 seconds of boarding, and I appreciated her taking the time to show me around and explain the features of the seat. She also told me about the Mint service, and all that entails (meals, entertainment, service, etc). Now that’s the kind of greeting I like! 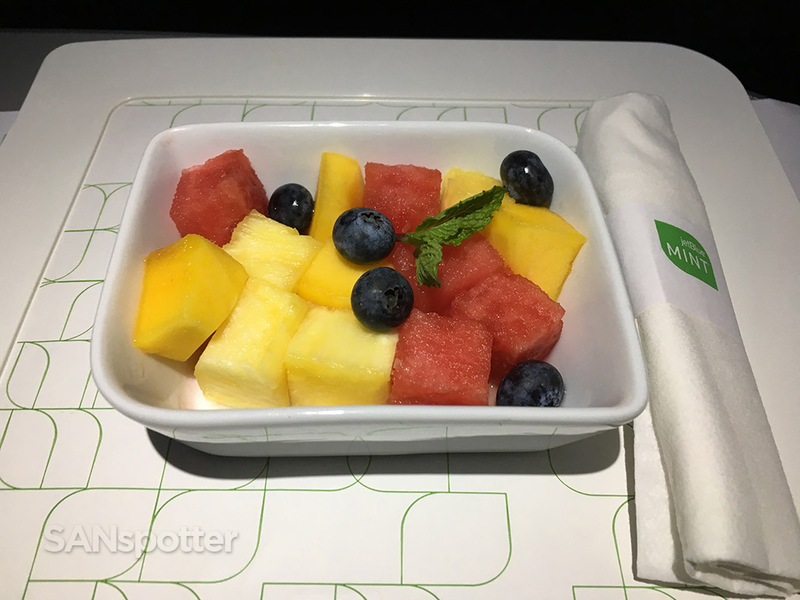 I didn’t get anywhere near that friendly of a greeting on my American and Delta premium transcon flights last year, so right away I was liking the Mint experience quite a bit. 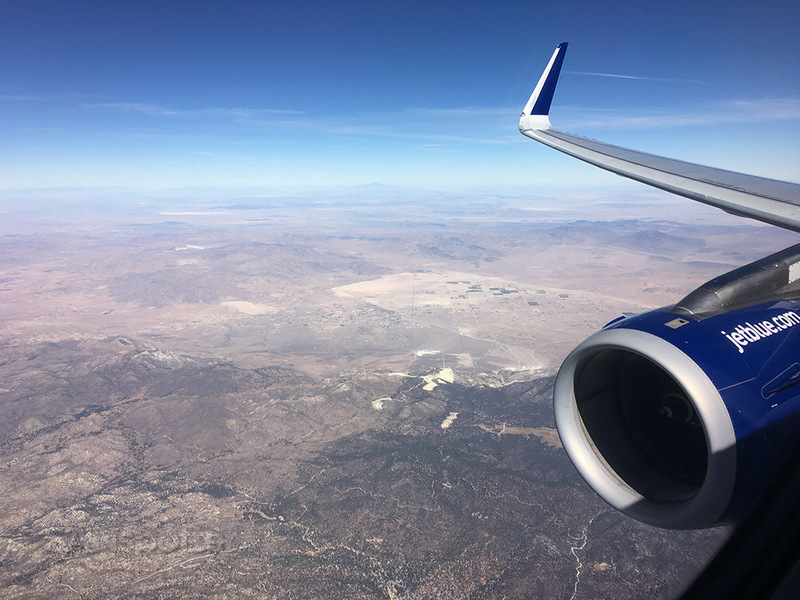 She offered me a drink before heading off to greet other passengers, and I started to get settled in for what I was sure would be a great flight. Brunch menus and headsets (non noise-cancelling) were distributed by the other flight attendant who was working the Mint cabin today, who’s name also happened Deborah. How confusing is that? 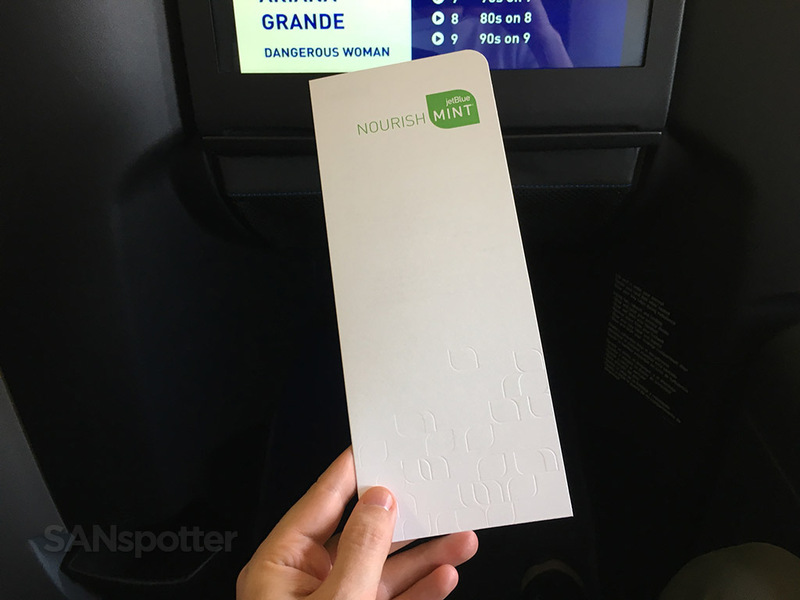 Cover of the JetBlue Mint menu (“Nourish Mint” – very clever!). 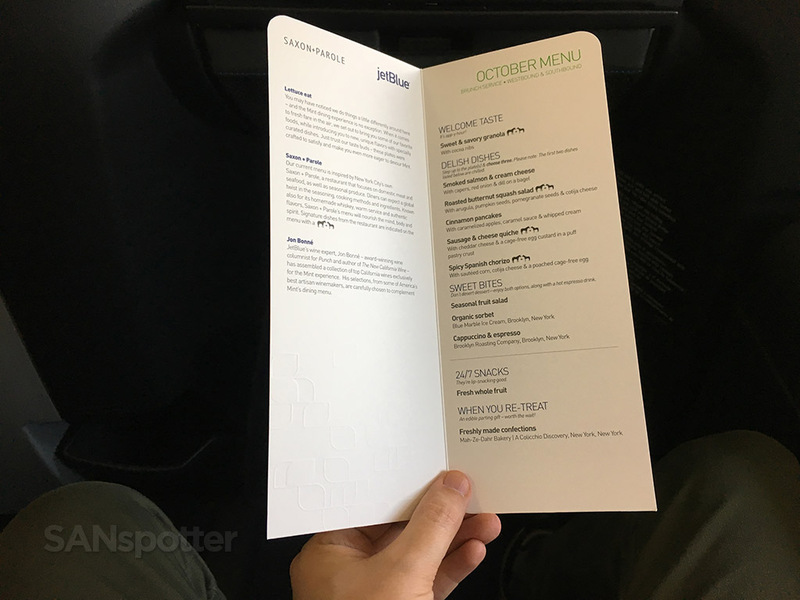 JetBlue Mint October 2016 menu. Grado Labs SR60e Prestige Series headphones here in JetBlue Mint. Loading up the last bit of fuel before we push off the gate. 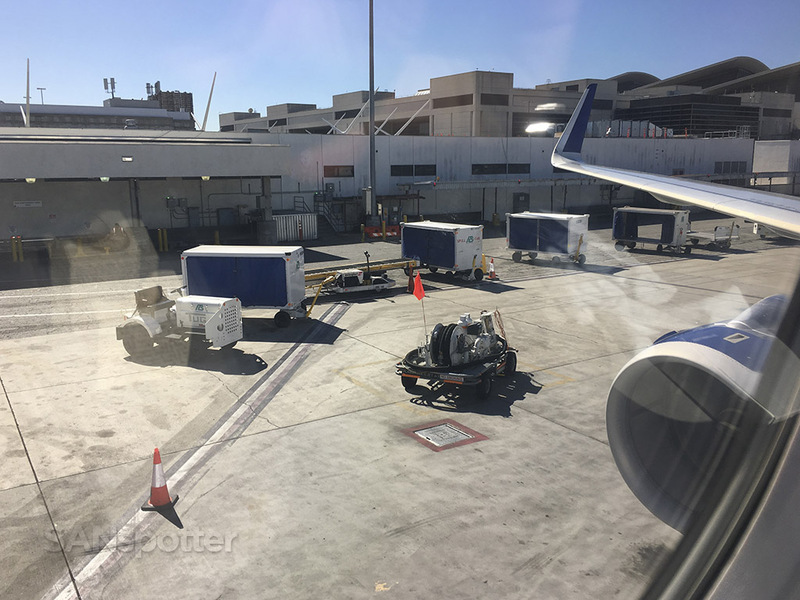 We never did make up much time during the boarding process, so we did end up pushing off the gate about 25 minutes behind schedule. 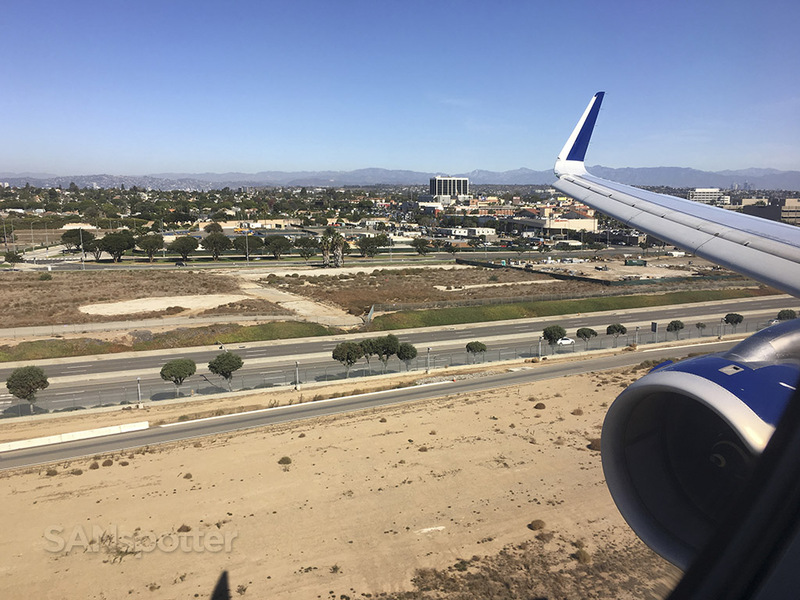 I didn’t mind so much since I had a long layover in LAX, but it was good that the taxi out to the runway was relatively short (by JFK standards) and we were off and on our way without much more delay. 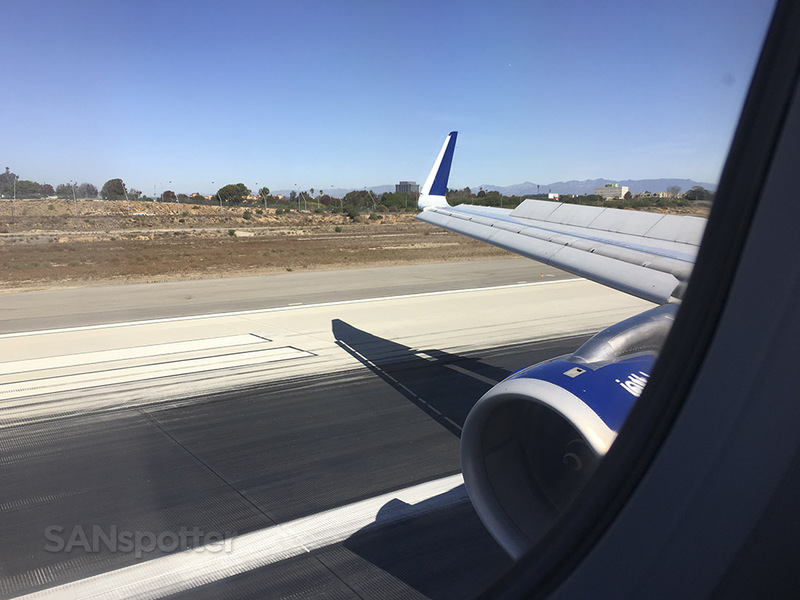 It was a bumpy departure though – I had a heck of a time getting pics that didn’t turn out blurry because of it, and the cabin service was delayed slightly until things smoothed out. Off the gate and on our way! 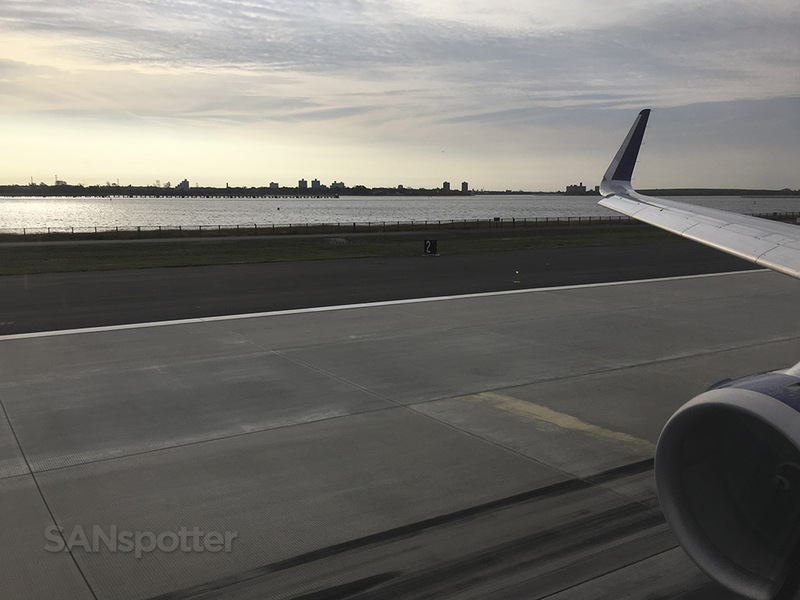 Taxiing out to the departure runway. 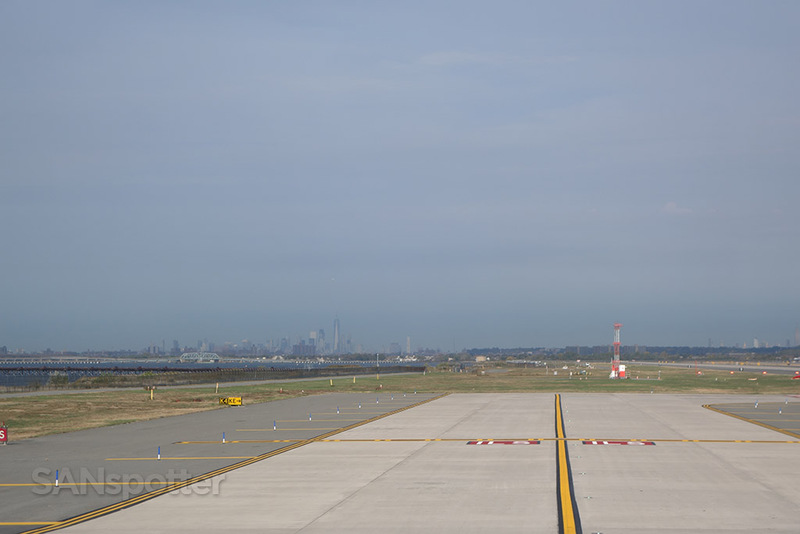 Nice view of the New York City skyline off in the distance as we made our way out to the runway. 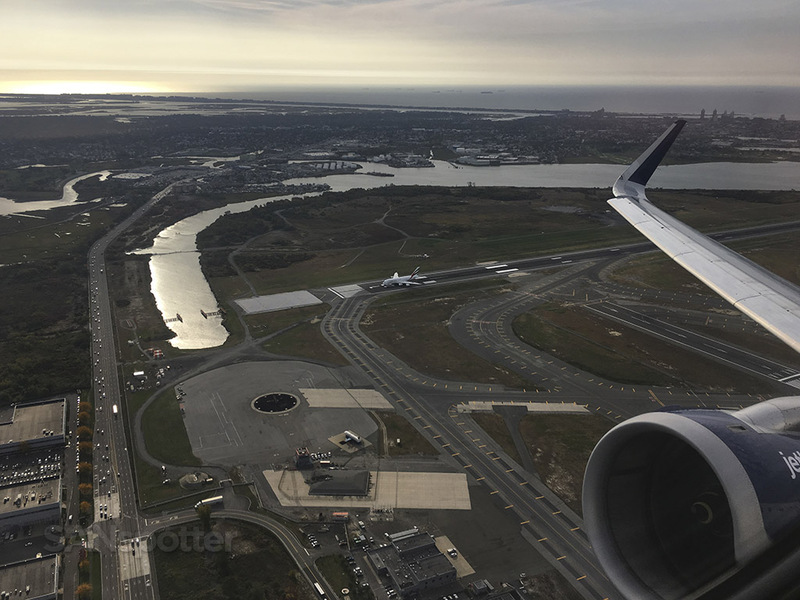 These A321’s sure can climb. 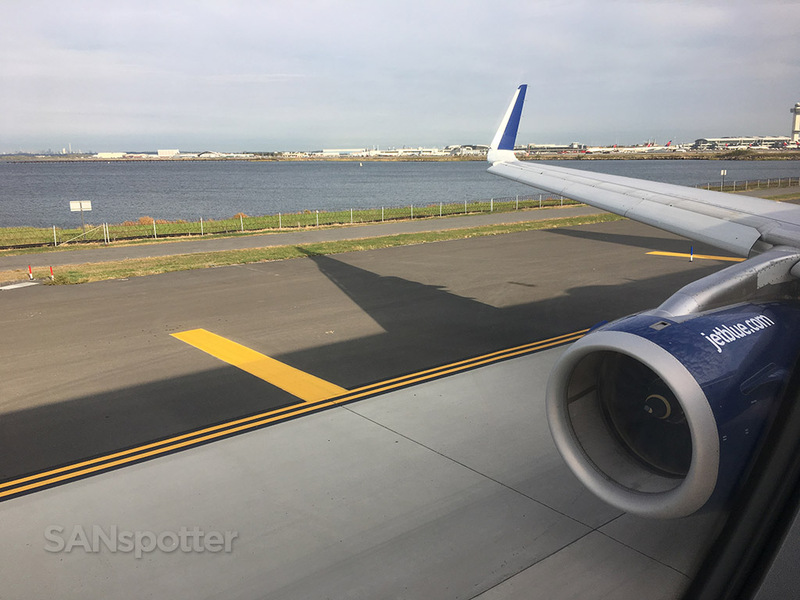 This was a very 757-esque takeoff. So long New York – I’m not sure when I’ll be back but I’m hoping it won’t be long. Once it was safe for the Deborah’s to move about the cabin, hot towels were distributed and brunch orders were taken. 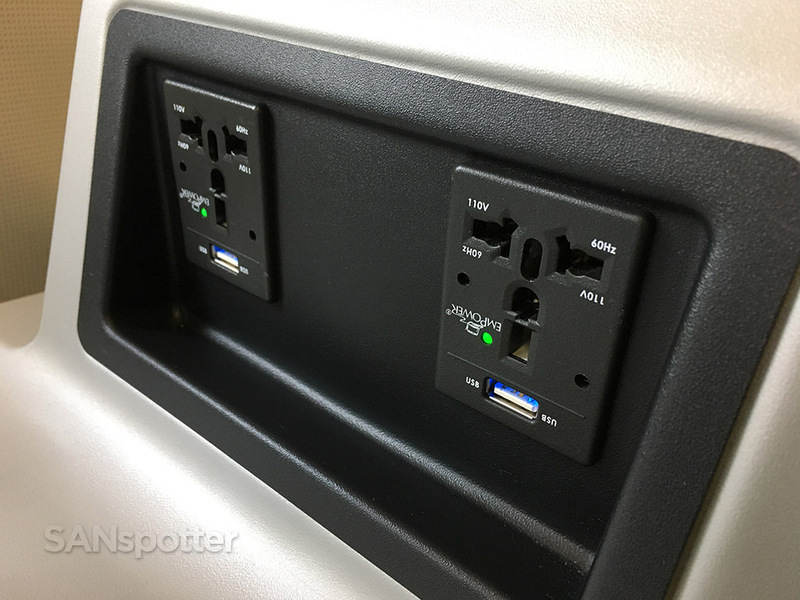 I passed some time getting my mess of cameras (two GoPro’s / Sony point and shoot / iPhone) and their charging cables in order, and I was really surprised how fast the in-seat USB ports charged them all. I know absolutely nothing about electricity, but those seats must have been turbo-charged or something because I had fully-charged devices within 15 minutes. 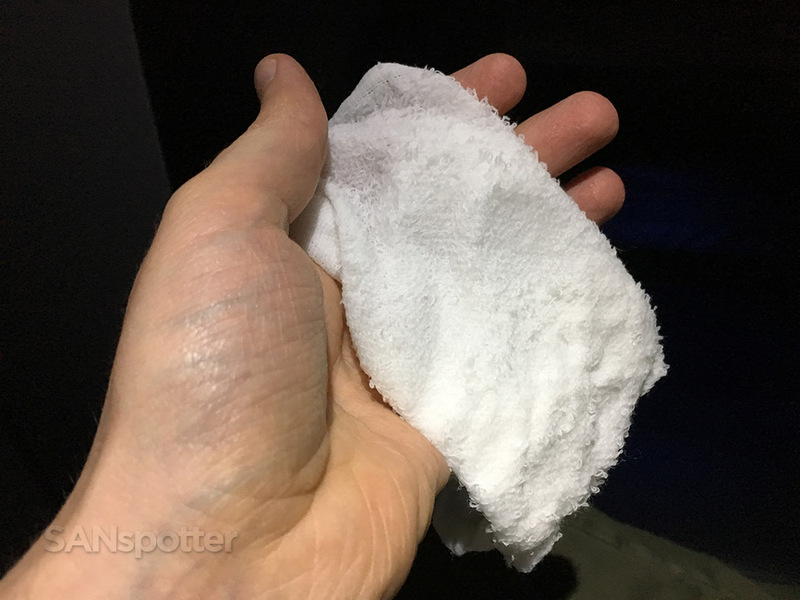 The infamous airline hot towel. Most of the time they are far too hot or barely warm, but this one was just about perfect. 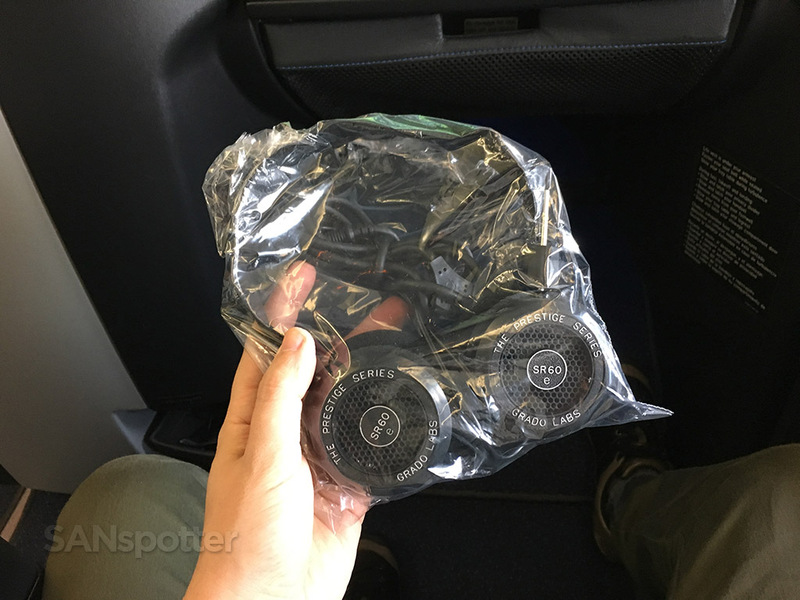 This is the outside of the JetBlue amenity kit. It’s basically just a cardboard box with goodies inside, but I thought it was pretty cool that there are two versions of it (one for men, the other for women). 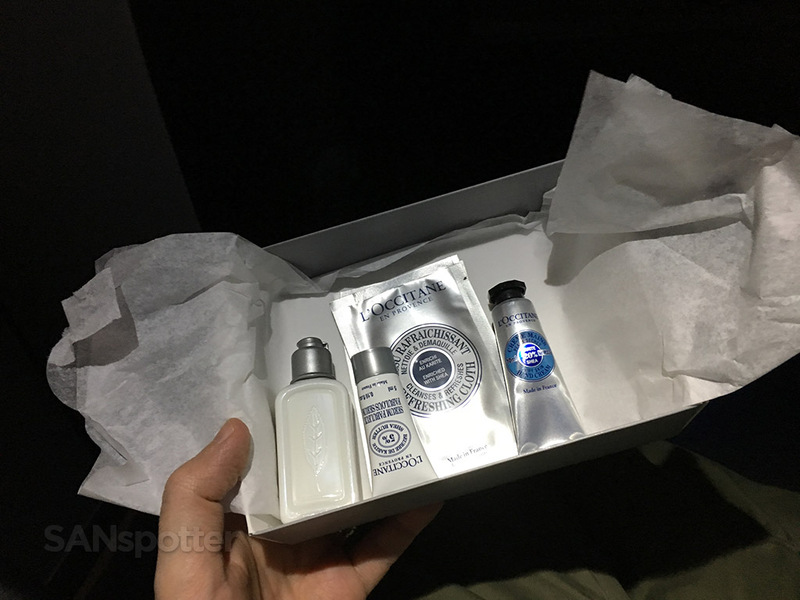 Contents of the JetBlue Mint men’s amenity kit. 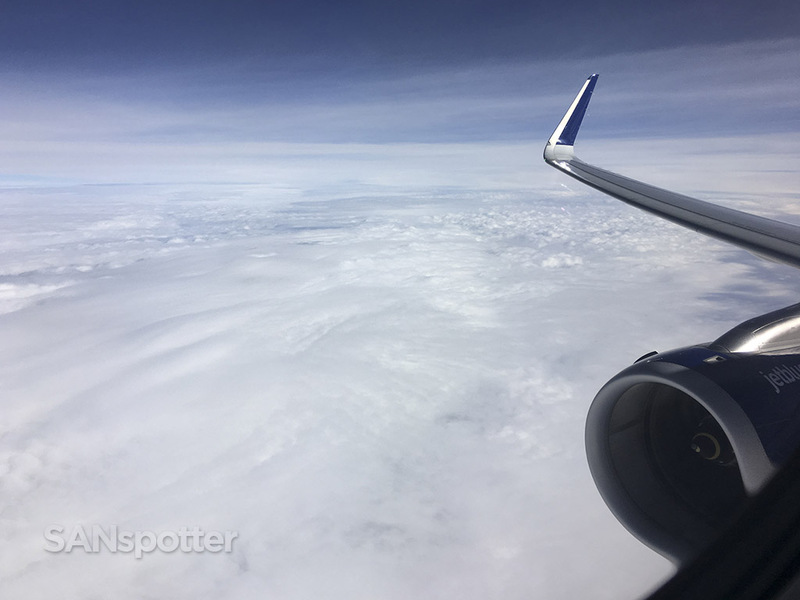 It was fairly overcast for the first portion of the flight, so there were not many good opportunities for window pics until later in the flight. I also thought it would be fun to play with the free WiFi, but just a few minutes of trying to get it to load a single web page on my iPhone made me realize that it was essentially worthless. 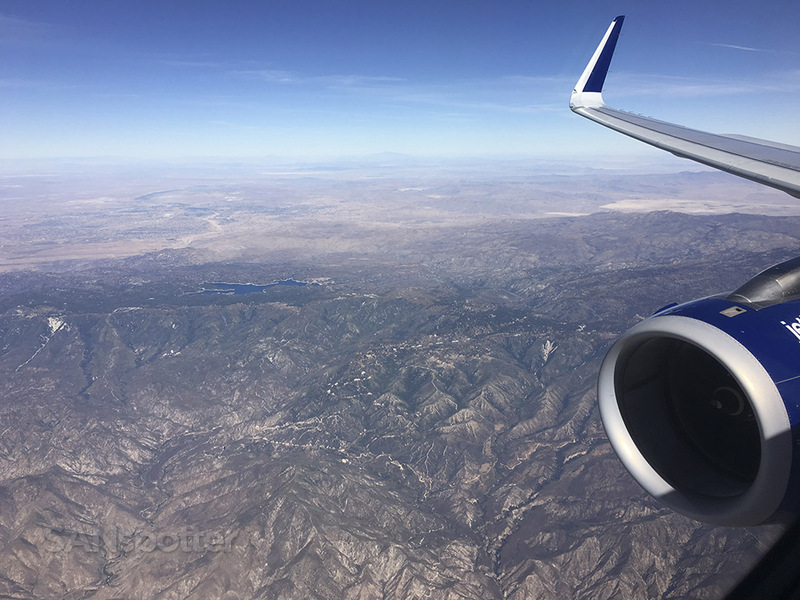 When are the airlines ever going to get in-flight WiFi right? 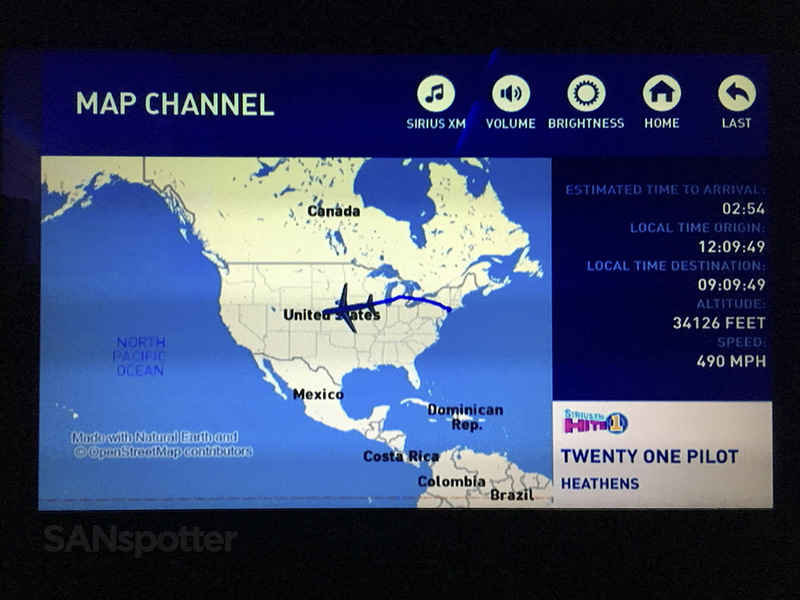 The in-seat video programming was quite good though, as it always is on jetBlue. 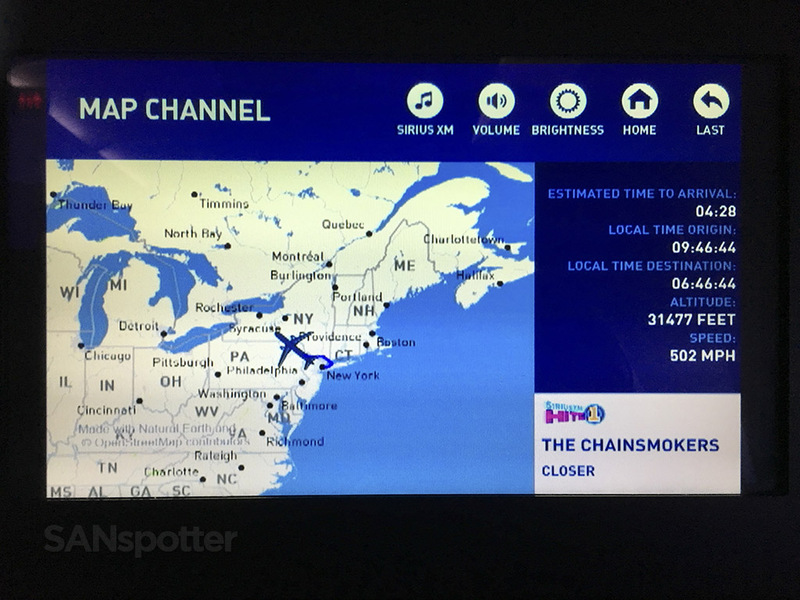 Live TV has always been one of their major selling points, and it’s kind of nice actually – there aren’t many other airlines who offer live TV these days. I do have two minor complaints about it though. First, it would be nice if there were some premium channel offerings. 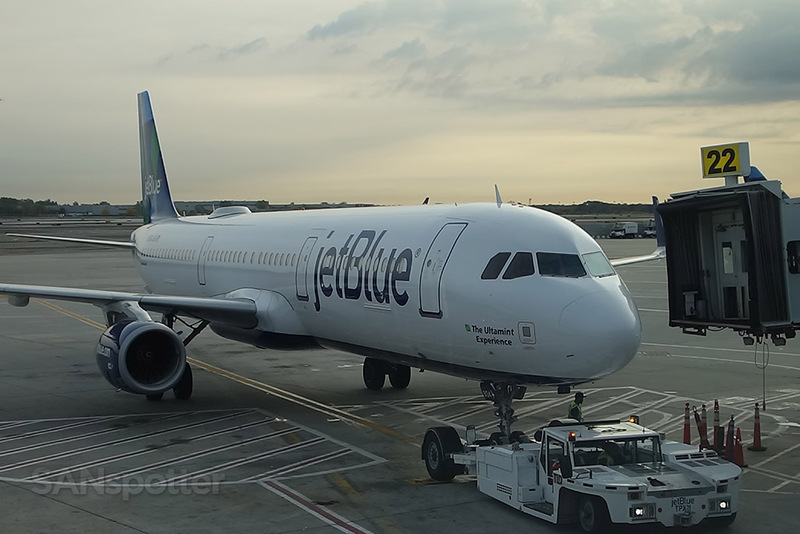 There are a lot of good shows on HBO these days, but jetBlue doesn’t offer that service. All you get is network TV, so if that’s not your thing, there really isn’t that much to watch. Second, the advertisements plastered all over the main menu (and moving map screen) were highly annoying. On-screen advertisements on the personal video screens were slightly annoying. It didn’t take long for the meal service to begin, and Deborah (which Deborah I couldn’t tell you) came by with a really tasty chocolate granola dish and drinks. I’m not entirely sure what that stuff was, but it was good and I wish they made it available for purchase. I’d buy a big box of it to take home! 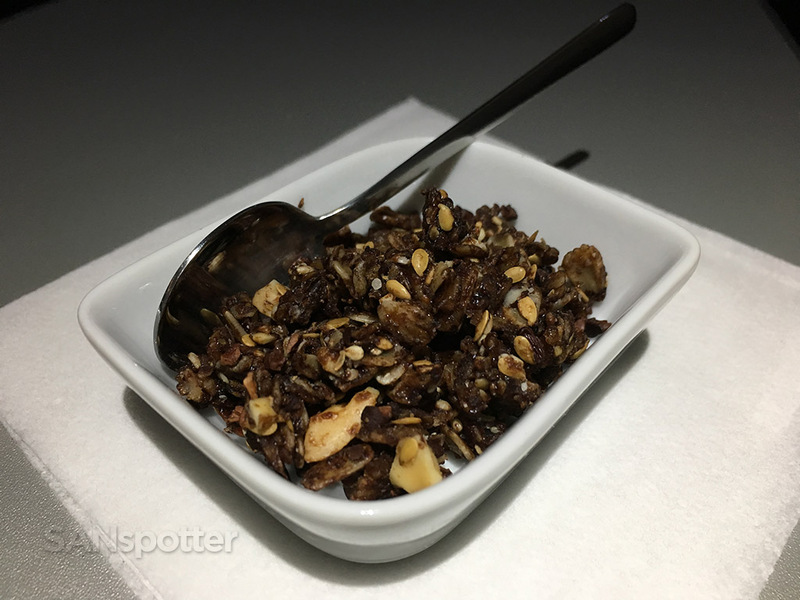 JetBlue Mint snack: a chocolate-granola mix which was phenomenal! 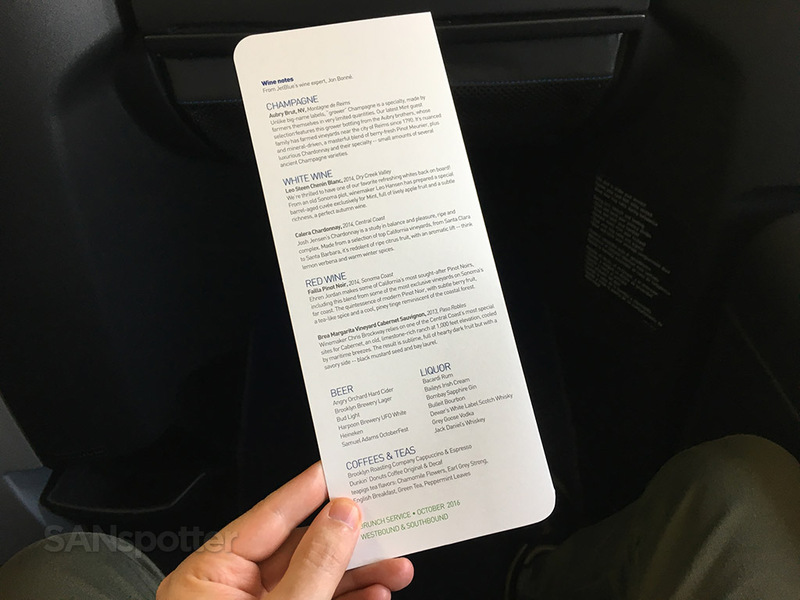 JetBlue Mint brunch service. 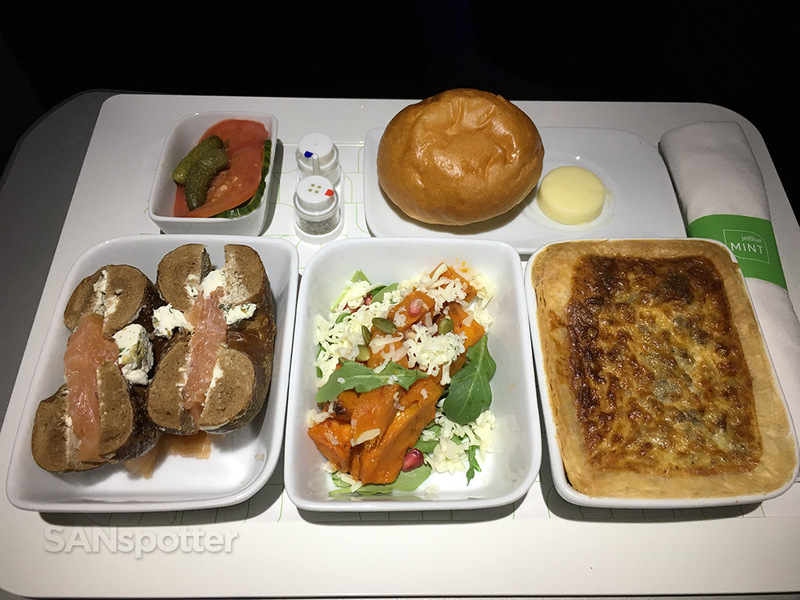 Each passenger got three choices from the menu, and I chose the smoked salmon and cream cheese, sausage and cheese quiche, and the roasted butternut squash salad. All three were delicious! 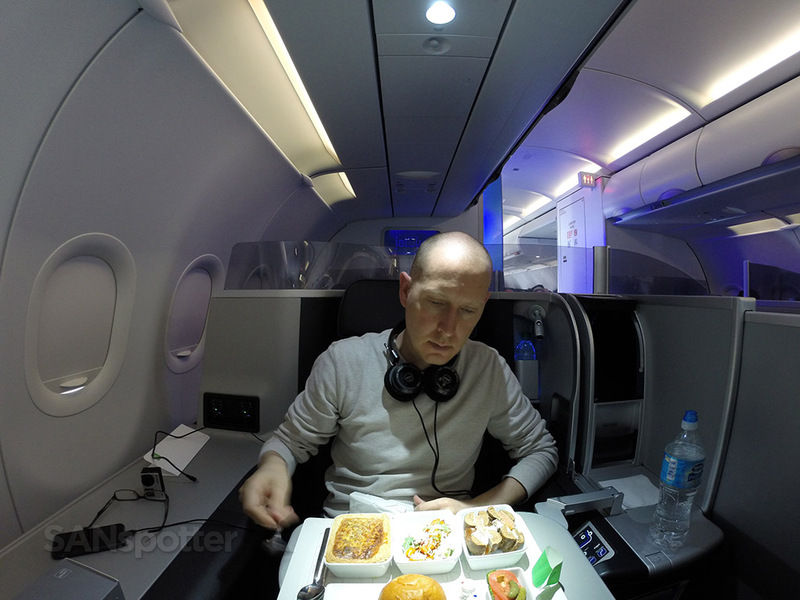 That’s me (SANspotter) digging in to one of the best airline meals I’ve had in a long time. Once the brunch service was over, I took advantage of the massage functions in the seat and laid that thing flat to give it a proper test. Long story short: SANspotter approved! 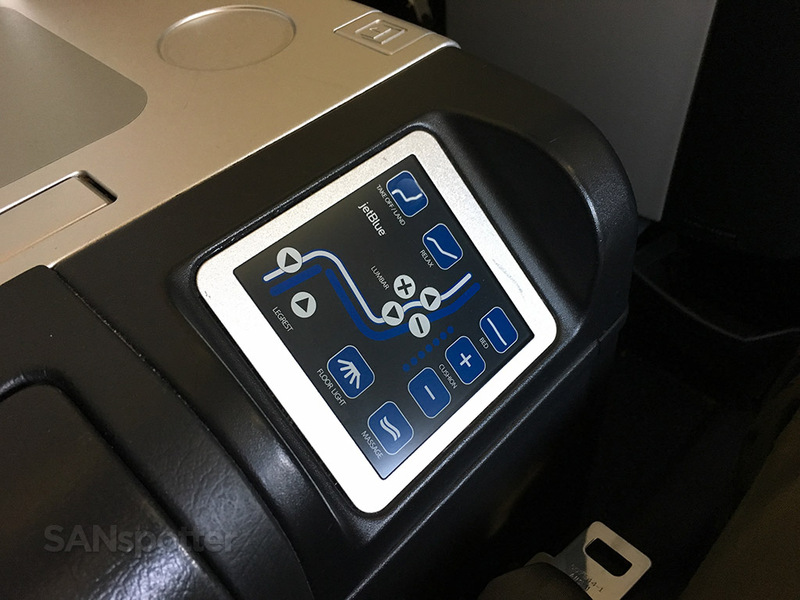 Magic happens when the seat is in the fully flat position and the massage function is turned up full blast. It was quite good, and it even started putting me to sleep even though I wasn’t tired at all. The only complaint I have about it is that that footwell is incredibly narrow and it feels excessively cramped when the seat is in the flat position. 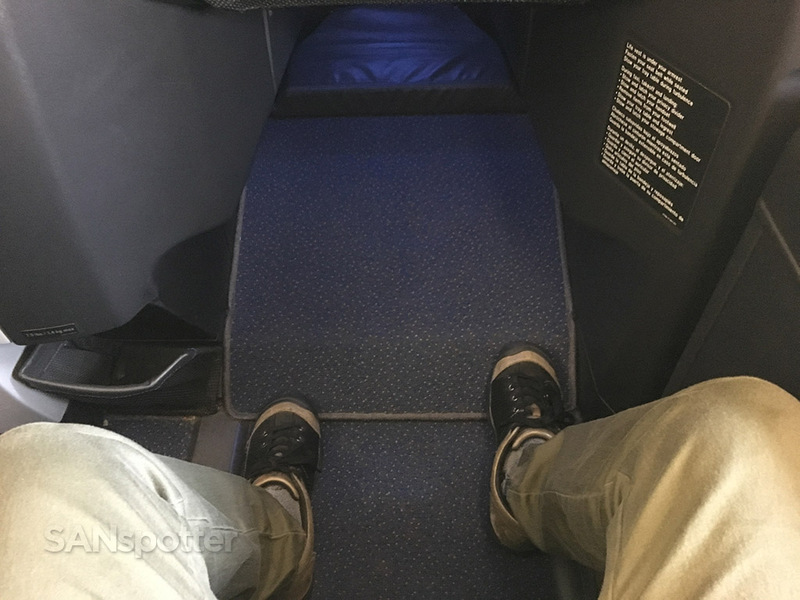 I don’t have big feet (US size 10), so I feel especially sorry for anyone with big feet in these seats. I’m not even sure how it would work actually. 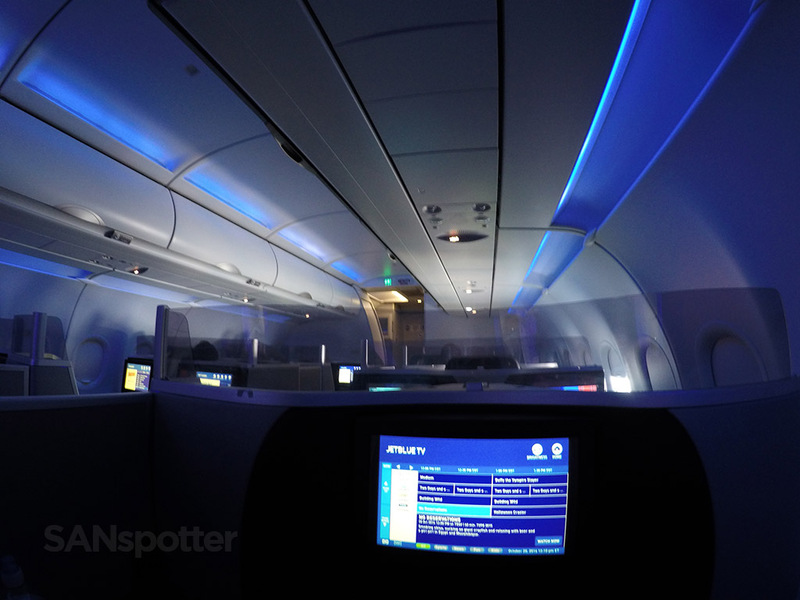 Cabin lights were dimmed after the meal service, leaving the entire Mint cabin bathed in cool blue LED mood lighting. 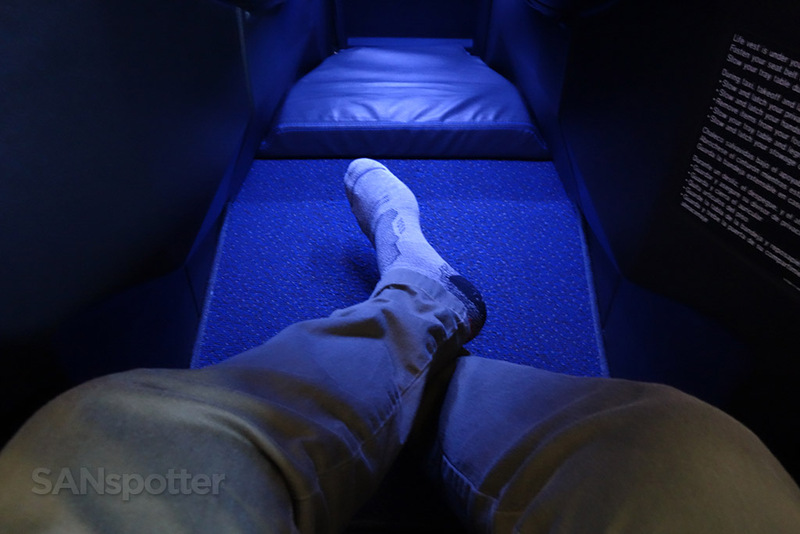 There was even cool blue mood lighting in the footwell of the seats, which looked great. Trying out the flat bed for a while. It felt great! The entire middle section of the country was a blur to me. I slept through most of it! 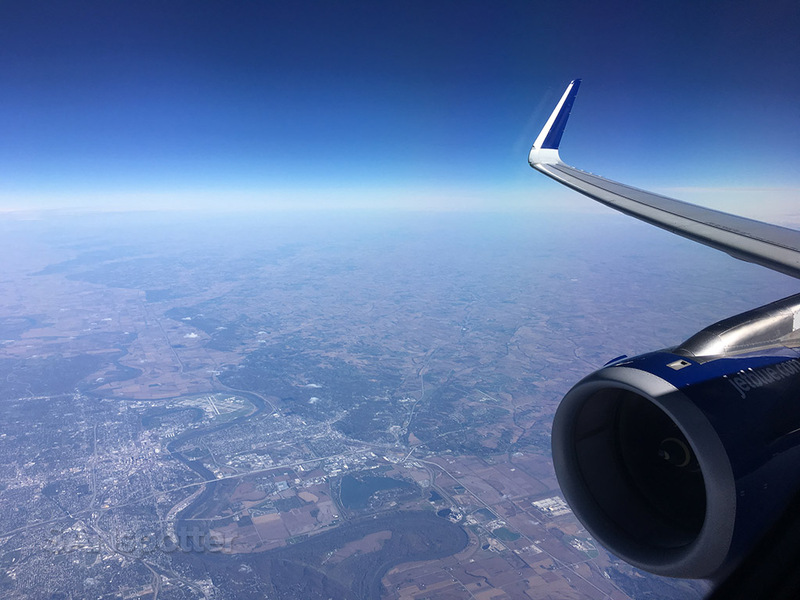 I was awake enough, however, to get a decent pic of Omaha, Nebraska as we passed overhead. 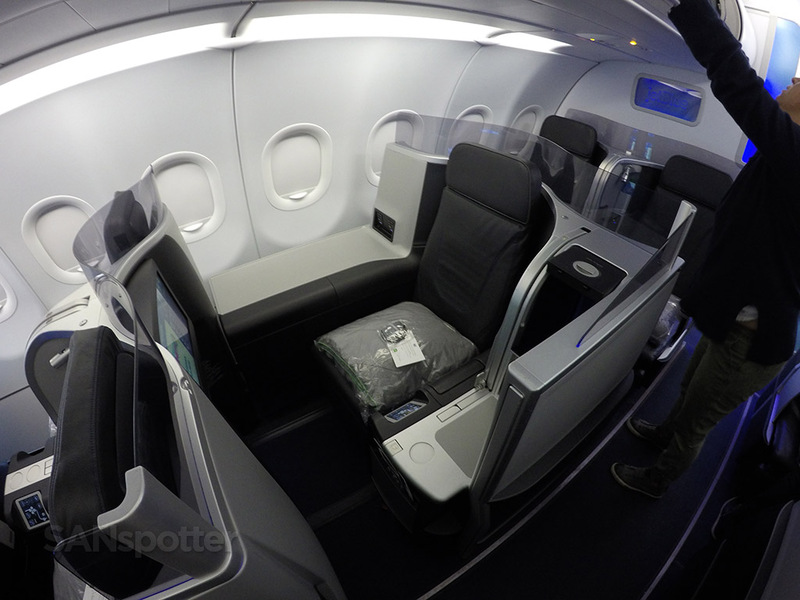 JetBlue Mint lavatory. 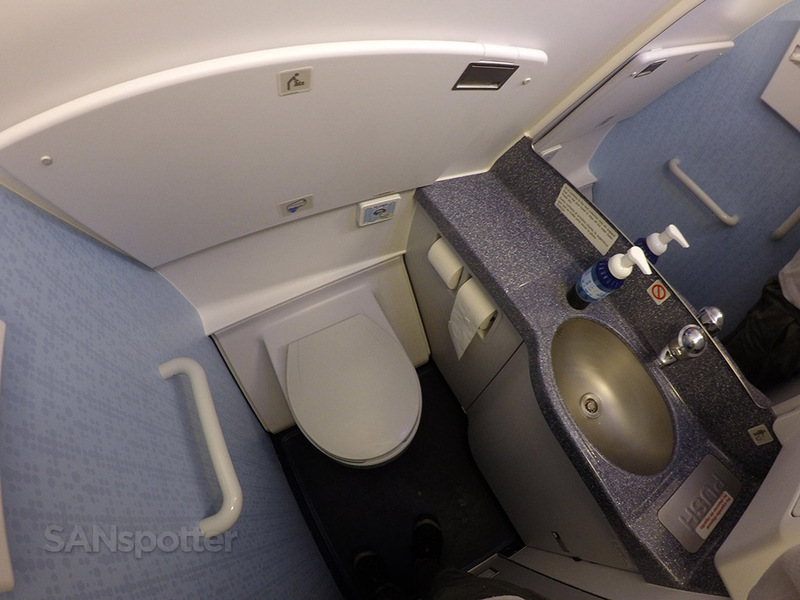 I’m not even sure why I take these pics – most of these airplane bathrooms are the same! When the terrain starts looking like this, you know you’re way out west! Only 45 minutes to go, and I was kind of bummed that my Mint experience was nearing the end. 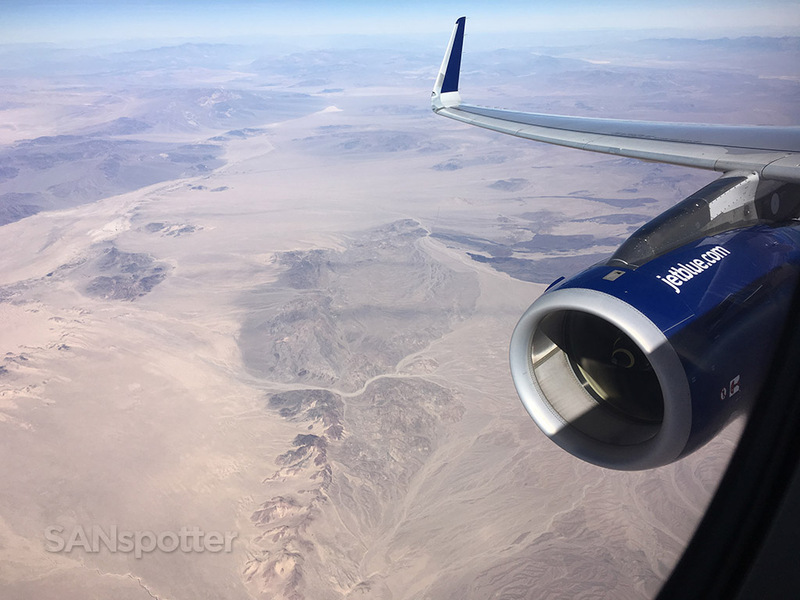 Starting the descent over the desert on our way into southern California. Slowly the desert landscape starts turning green the closer we get to LA. Starting to look like LA now. 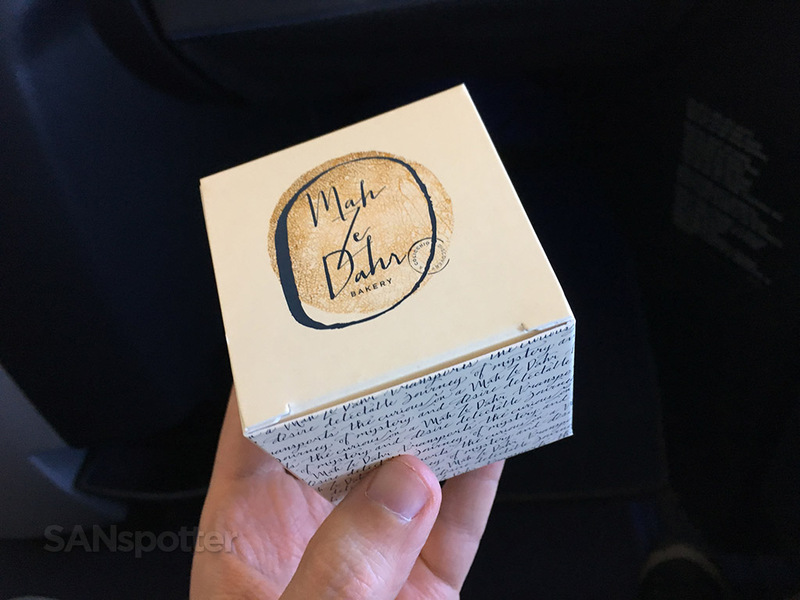 Hot towels were distributed with 45 minutes of flying time remaining, and I was really surprised when the Deborah’s came through the cabin one last time handing out boxes of fancy cookies as we were descending into LAX. Wow! Now that’s the kind of little detail which makes for a great passenger experience IMHO. Keep in mind I am not a fan of sweets and I don’t eat cookies at all, but the gesture is what I liked. I’ve never yet seen anything like that on other airlines, which surprises me considering how cheap a little perk like this is. The bang for the buck with this sort of thing is huge and I’m really surprised more airlines aren’t doing it. 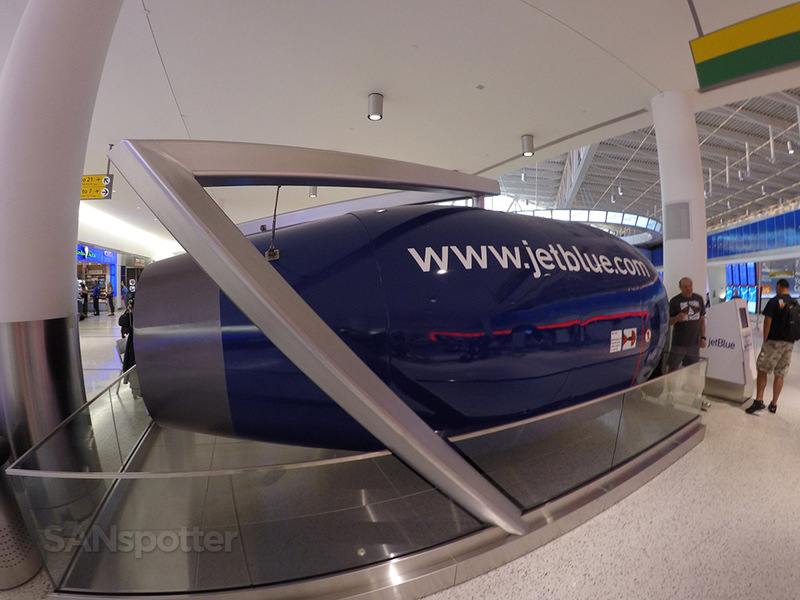 An end-of-flight gift from JetBlue. Cookies! Downtown LA looming in the distance. 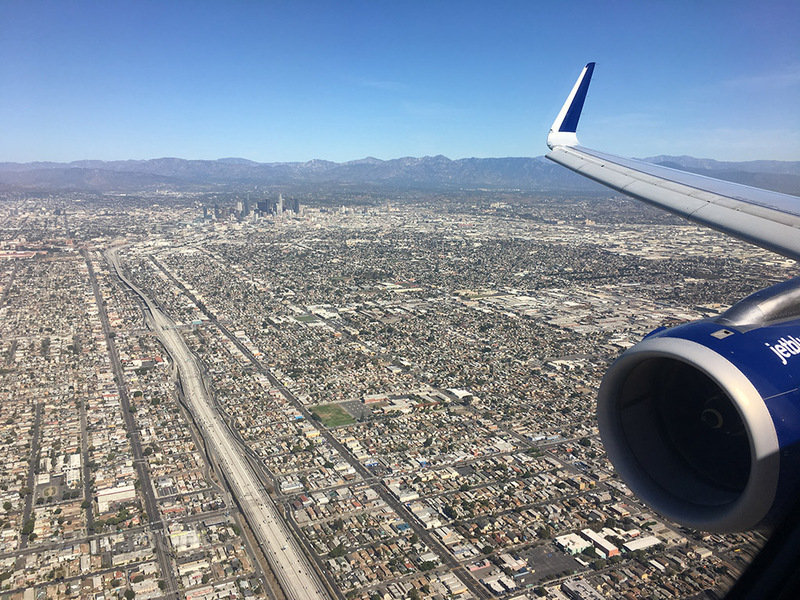 Moments before touchdown on 24L at LAX. 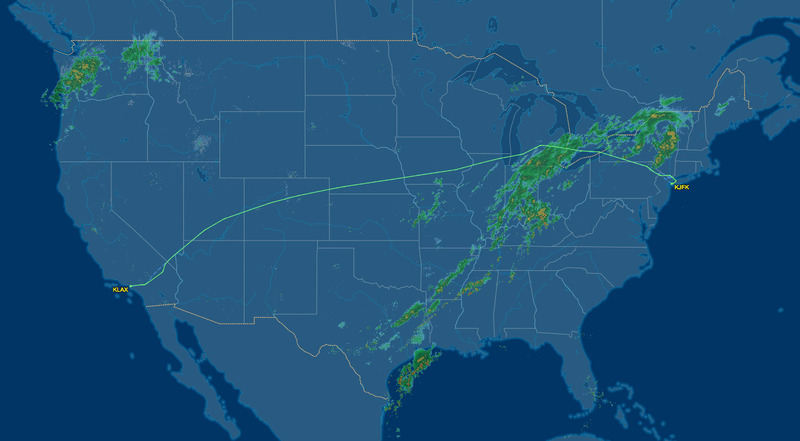 It was right about now that I wished that I could stay on this flight for another 5 hours. 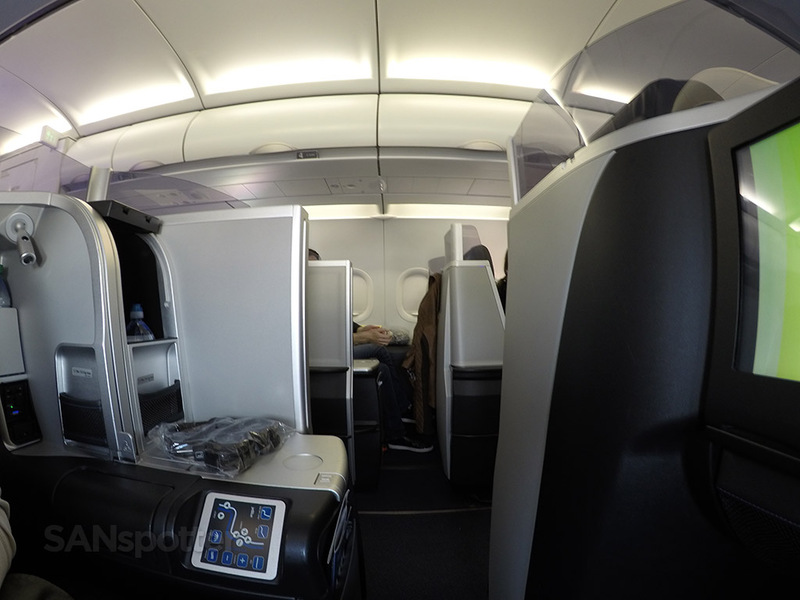 It was good to be home, but the JetBlue Mint product is really good! 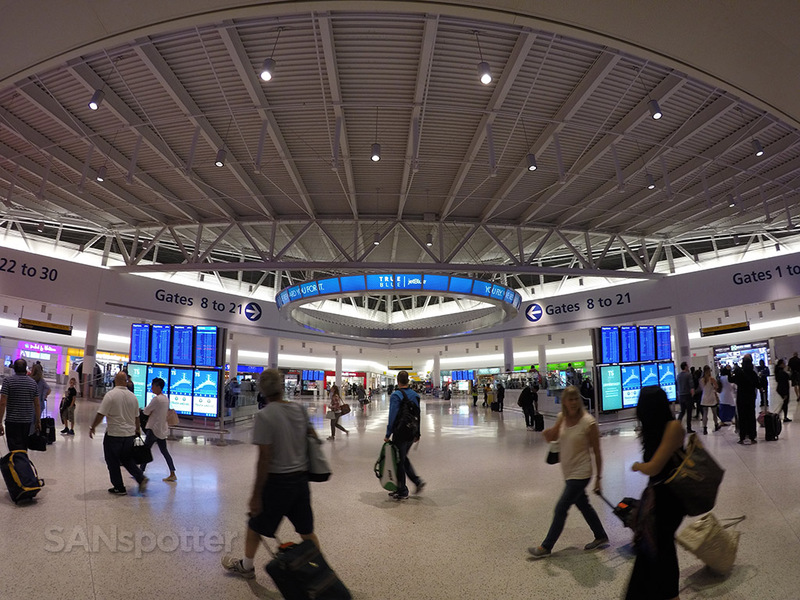 Pulling up to the gate here in terminal 3. 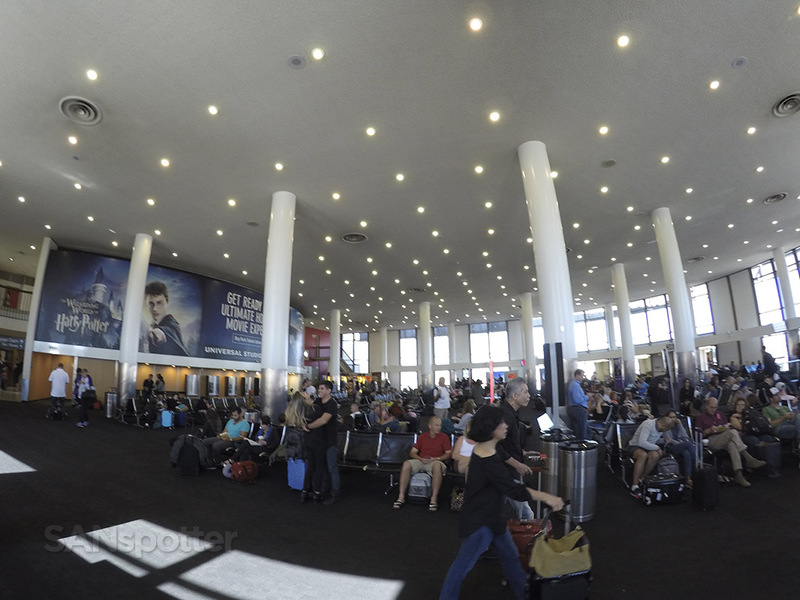 Inside the old but history-rich terminal 3 at LAX. The last time I was in here was 1999! 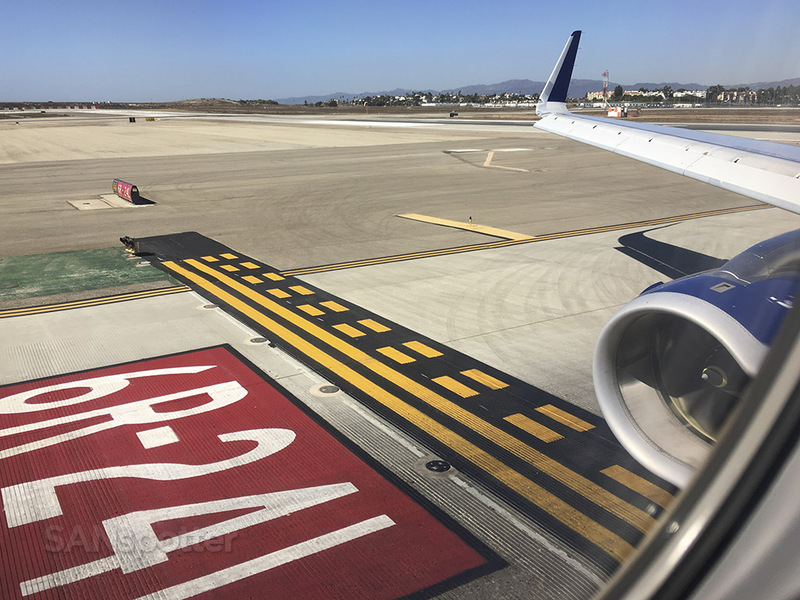 Terminal 3 is one of the oldest here at LAX, and will soon be completely renovated. It’ll be sad to see it go, but at the same time, an update is badly needed. 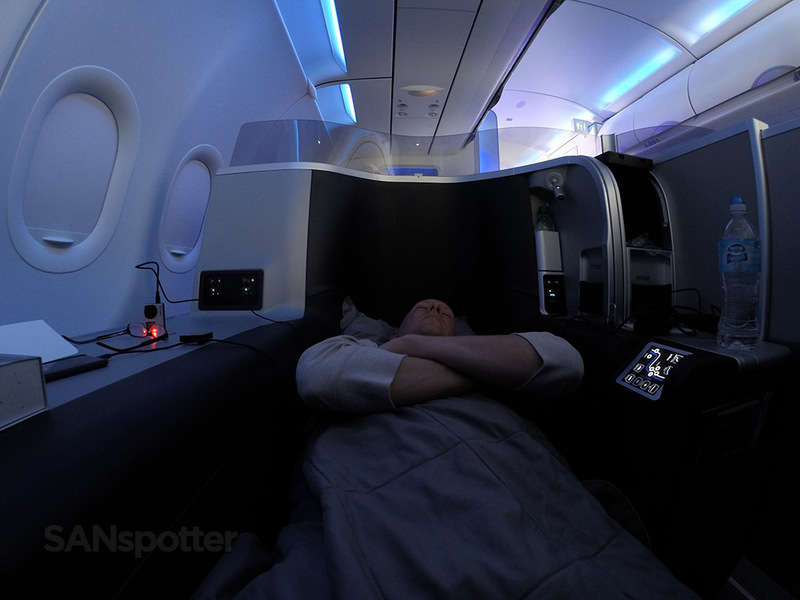 And that wraps up my first ever experience in jetBlue Mint. It was definitely everything I hoped it would be (and more!) 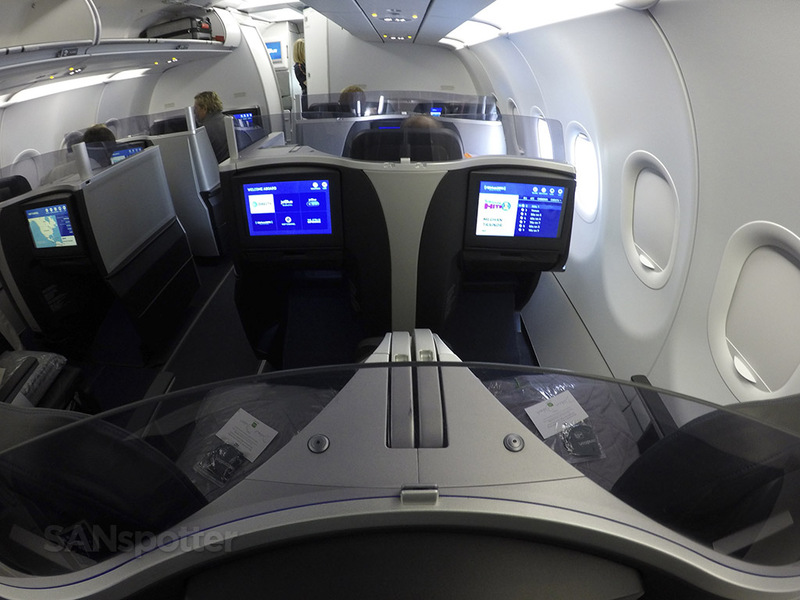 and I’m proud to proclaim it as my new favorite premium transcon service. I should note that having one of the really private single suites is what made this experience so good. 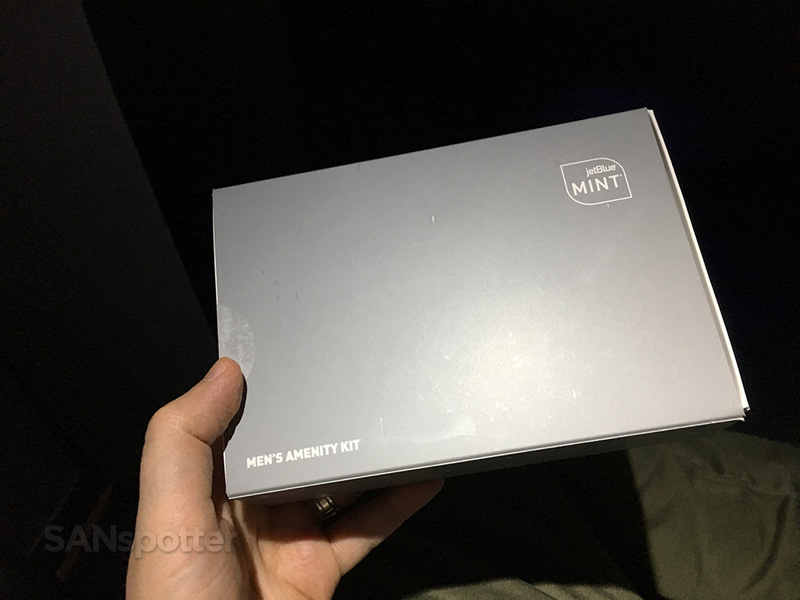 Would I have enjoyed the Mint experience as much if I was sitting in one of the shared seats? Honestly, probably not. 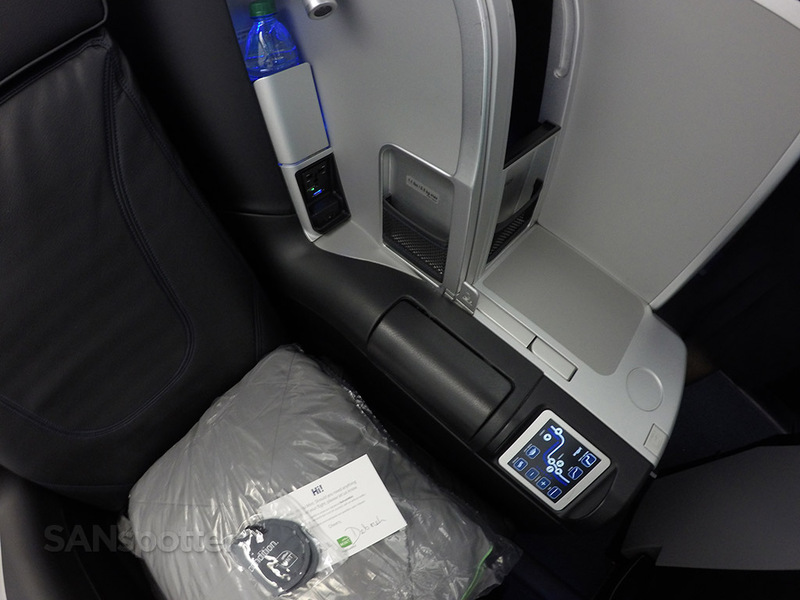 And while I’m being realistic, I’d like to point out that the ground experience for jetBlue Mint is abysmal. 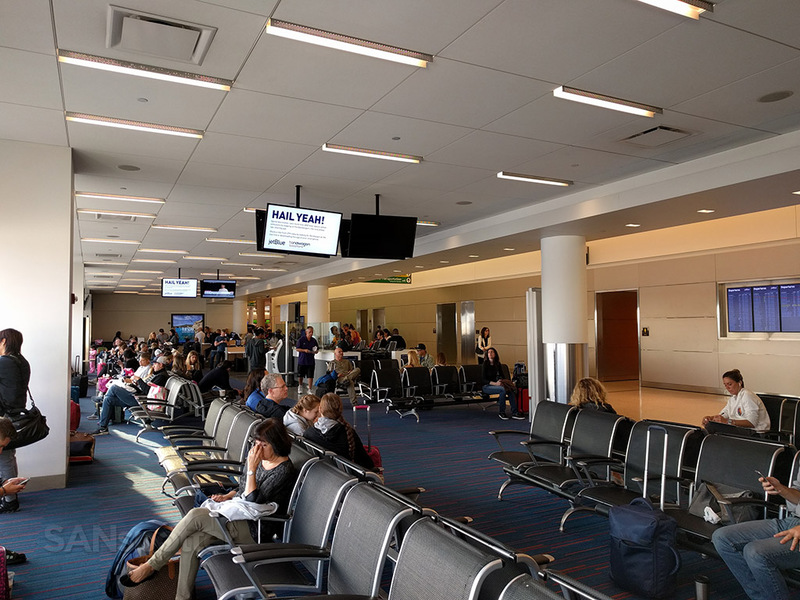 There are no lounges on either end (JFK and LAX/SFO) so you’ll have to fight masses immediately before and after the flight. 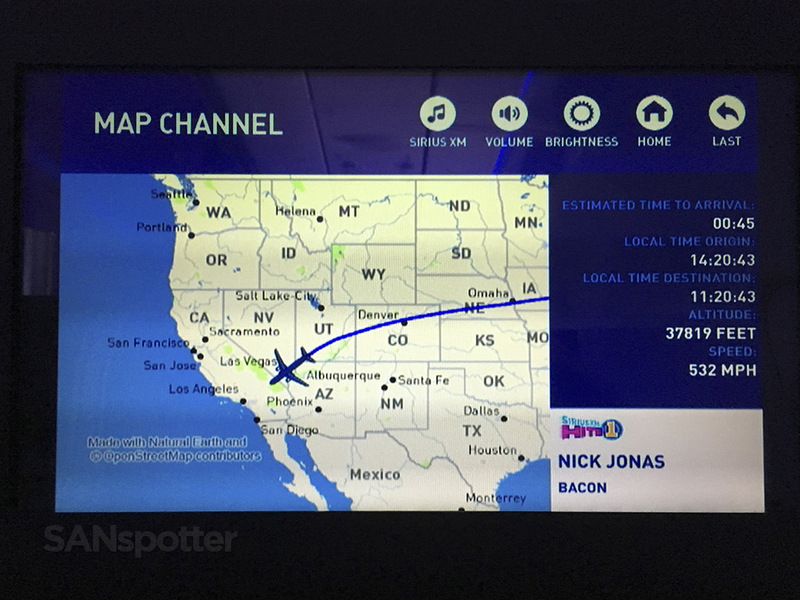 But once onboard…wow. The onboard service more than makes up for the lack of lounges, enough to make me a really big fan.